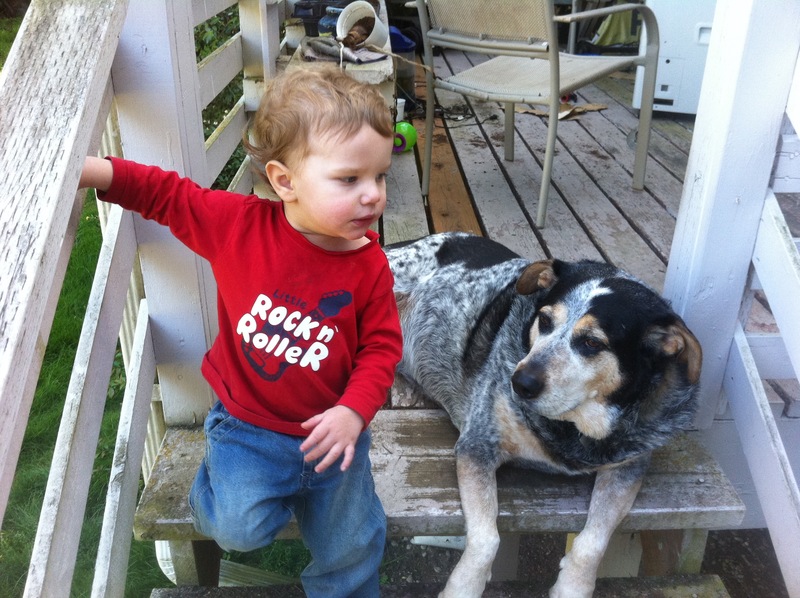 Almost exactly three days ago as I post this, we lost our dog Roscoe. 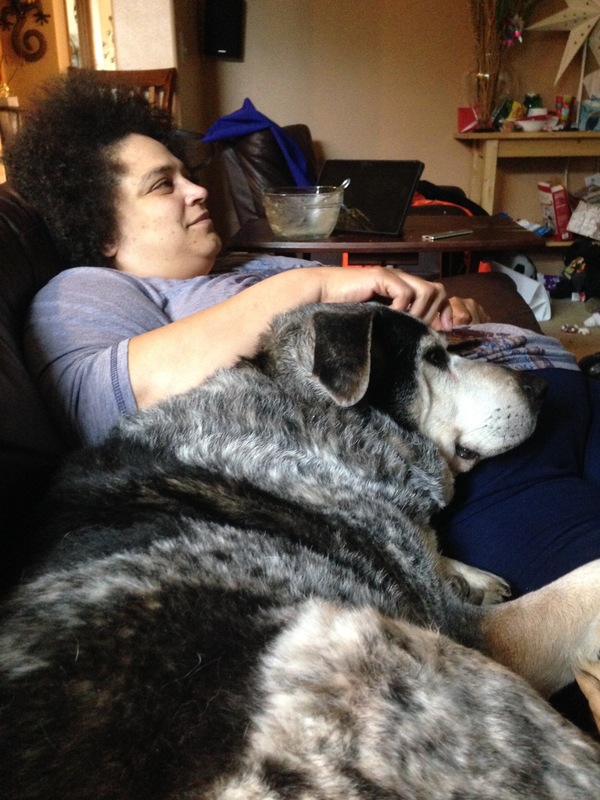 He was an old dog for his size, so we knew we didn’t have too long, but he didn’t have any obvious health problems, so we thought we had a little while longer. He had gotten slower with age, and in the last few weeks he had gotten a little bit grumpier, but otherwise he was acting normally up through Sunday afternoon. After dinner we realized we hadn’t seen him in a little bit, and he hadn’t come in from the backyard to beg for the last bites of our food like he usually does. We found him curled up in a hole he dug under his favorite bush, unwilling to move. 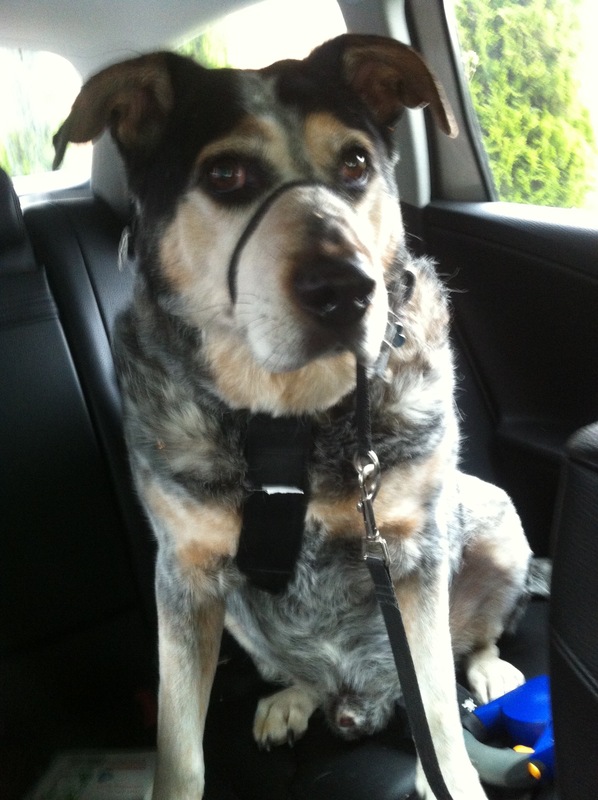 With some effort we got our old 100 pound dog into the car to an emergency vet. The news was not good. He was bleeding internally from a previously unknown tumor. There were no good treatment options and an impossible prognosis, with very little chance of meaningful recovery. They made a strong recommendation that we end it right away rather than let him suffer. Brandy and I had a little time to say goodbye before we let Roscoe go. We pet him and told him we loved him and that he was a good dog, and then he was gone. It has been a rough three days. 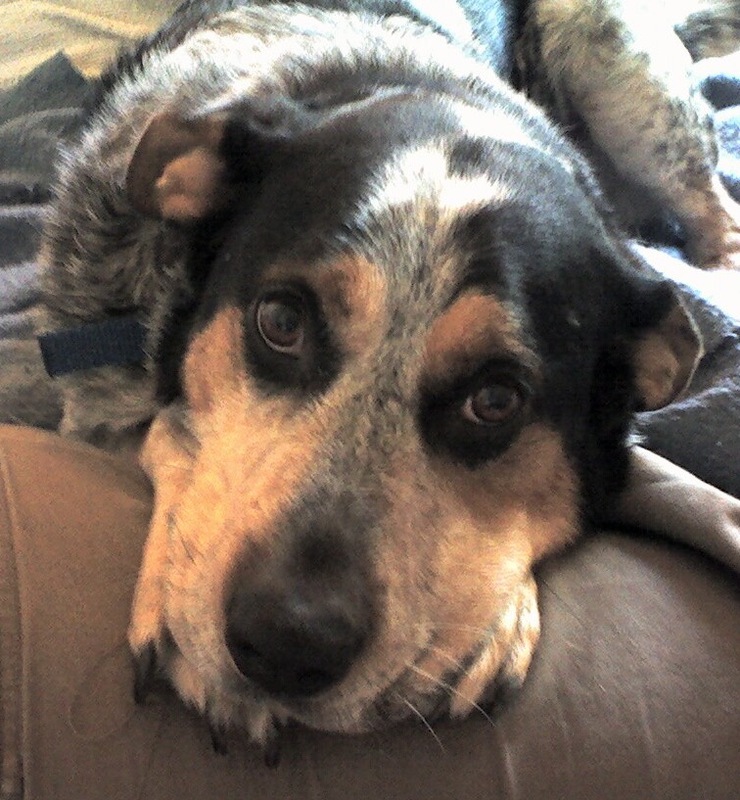 Roscoe has been an important part of our family for nearly a decade. 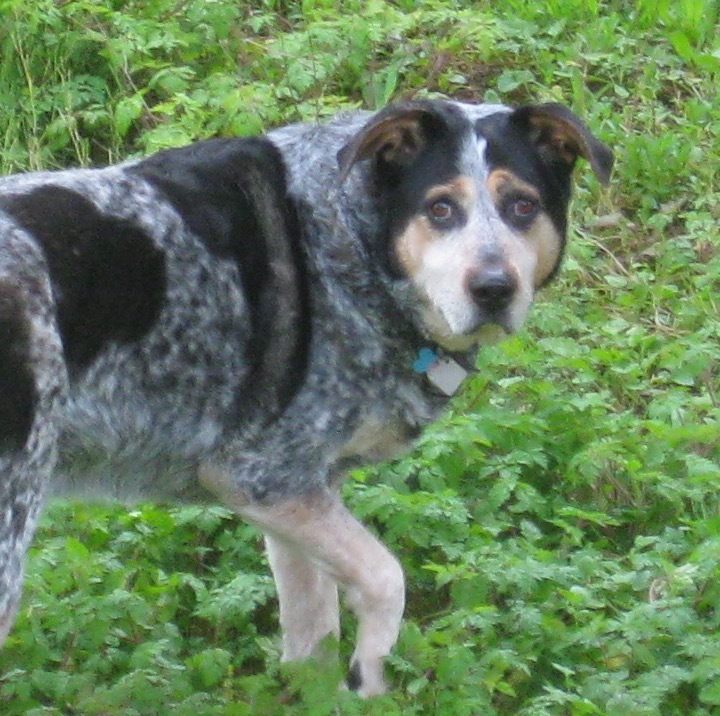 He was a funny dog, very smart in many ways, seeming to sometimes understand full sentences and do various clever things, but still running to the door to bark whenever a doorbell rang on TV. The early days we had him were very rough. He was a bit wild, and very anxious. 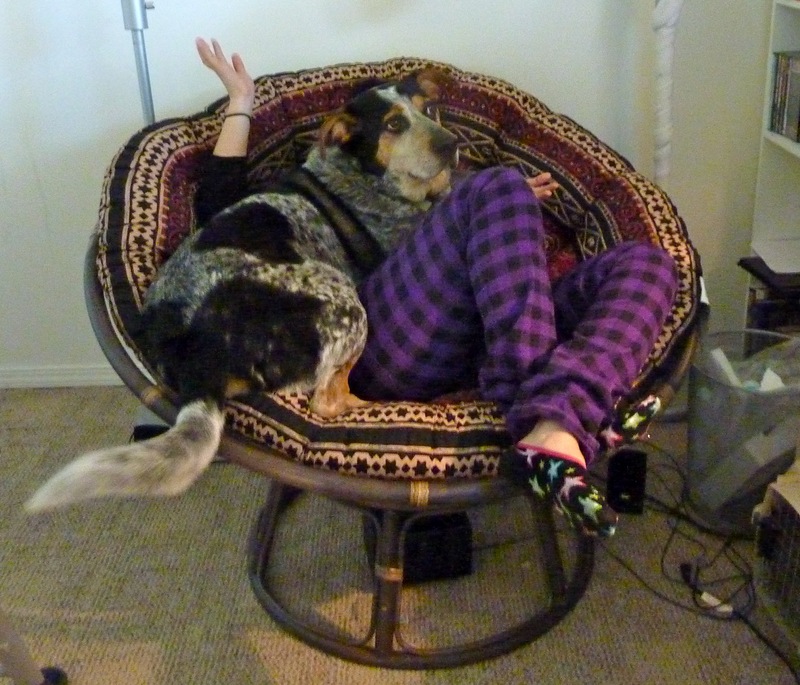 He was a rescue dog, and his experiences before us apparently were not the best. And he caused our family some pain at the beginning. By the time Alex came, he had calmed down a lot, but we were still a little worried. 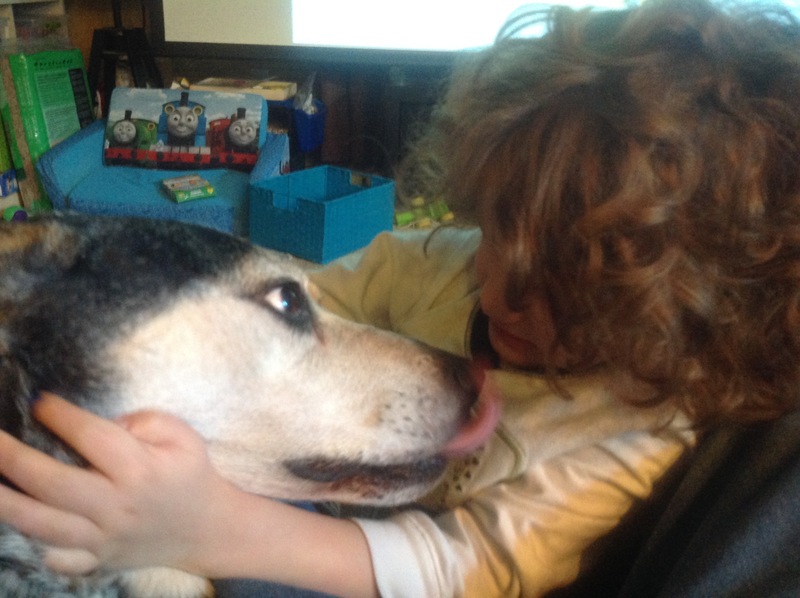 Our fears dissipated quickly though, as he seemed to know what he had to do, and he became an incredibly patient dog, tolerating an unruly small child better than we could ever have hoped. 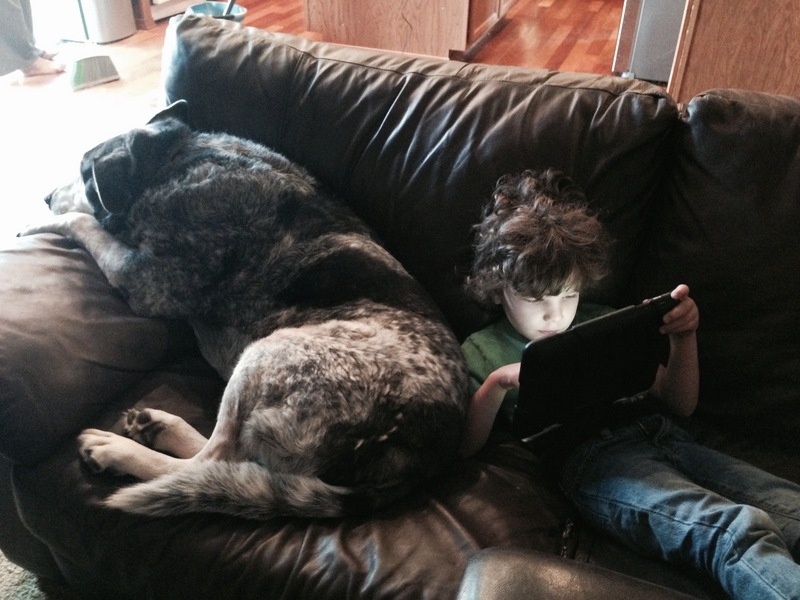 Alex has never known life without Roscoe, and they were often inseparable. Alex’s first word was “dog”. 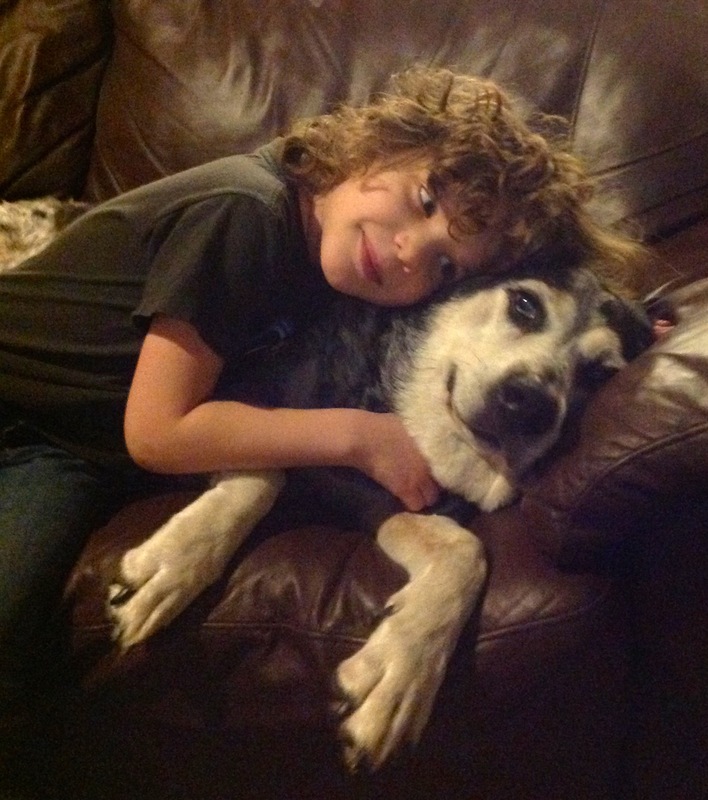 Roscoe was his brother and best friend. 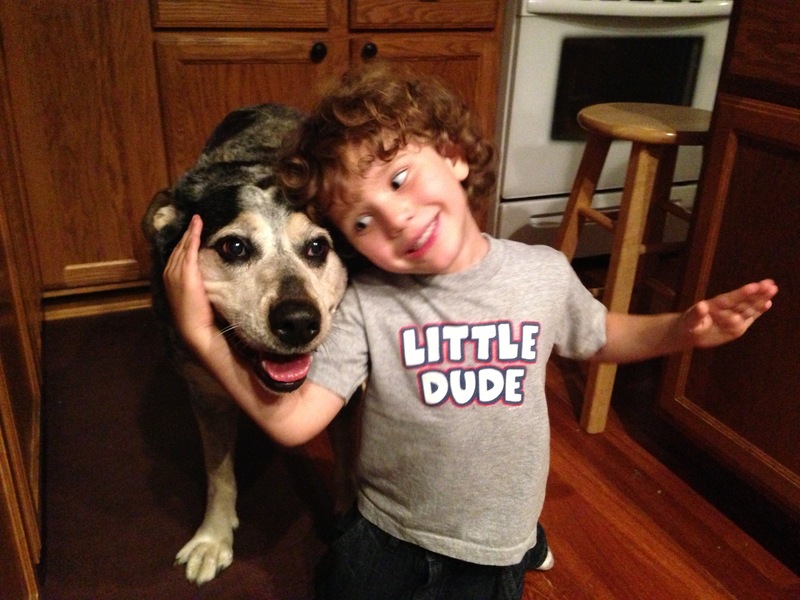 Roscoe’s job was to take care of this little guy, and Roscoe knew it from the start. 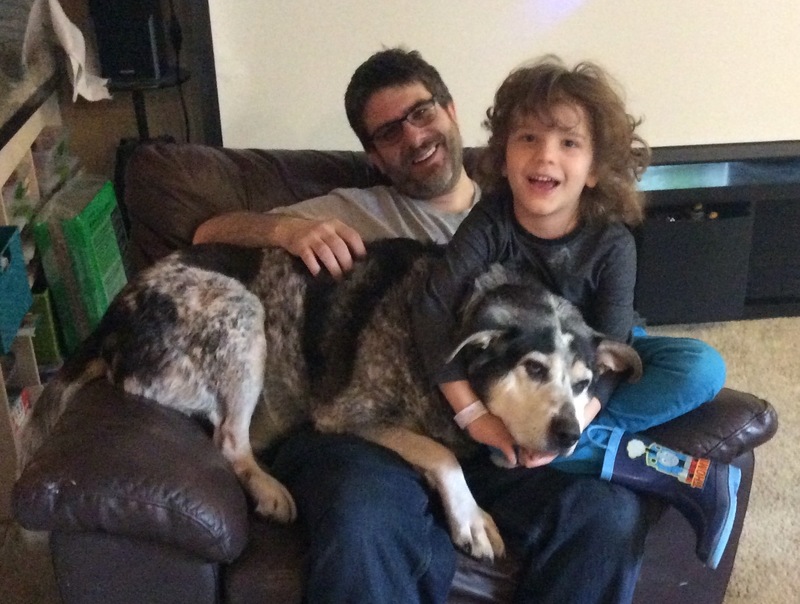 Since a few hours after Roscoe died, I have wanted to do this post, including sharing some of the best pictures and videos of Roscoe. But narrowing down the many hundreds of pictures we had was extremely emotional, and I could only do it for a few minutes at a time. I wanted to get it down to just 40 or so, about the size of the monthly family pictures posts I sometimes do. But after getting it down to 100, I decided I was done. 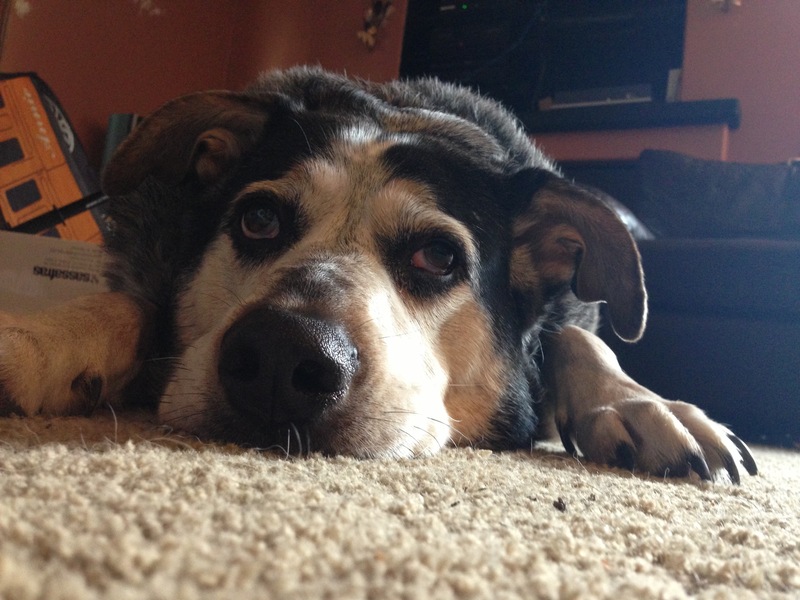 This post is mainly for family and friends who knew Roscoe, and a few extra pictures are OK. So here are 89 pictures, 10 videos, and 1 picture with audio, in chronological order. This is Roscoe’s life with us. We miss you so much buddy. 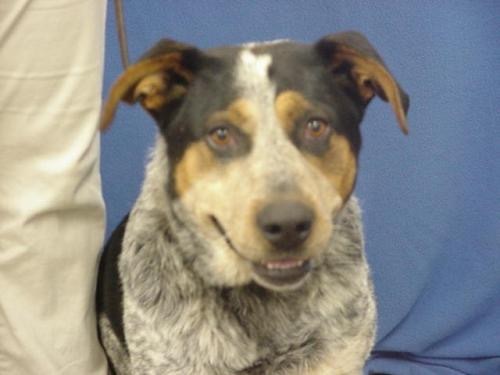 2006-09-15 04:33 UTC: This was the picture Brandy found online when looking for a rescue dog to adopt. Brandy knew this was the right dog almost immediately, and we went to the shelter looking specifically for Roscoe, which was the name that had already been given to him by the people where he was. He had been found wandering alone and no family came to look for him. He had already moved a couple of times between shelters. They said they guessed he was probably about 2 years old at the time, although based on behavior, he might have been a little younger. 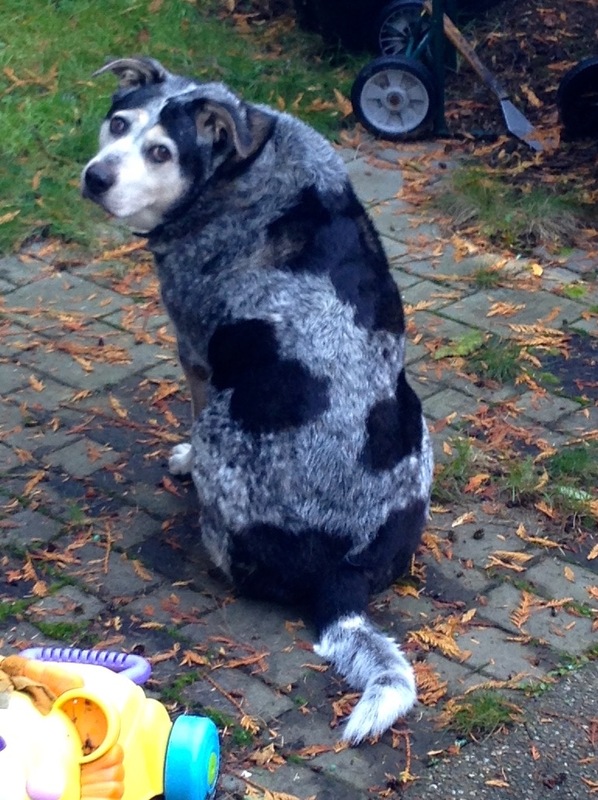 We visited him, and he ran around in circles and barked, without interacting with us all that much. We picked him anyway. He hopped right in the car to head home. The rest of 2006 was a bit rough honestly. There were some very hard times with him. One time in particular. But we stuck with it, and with him. 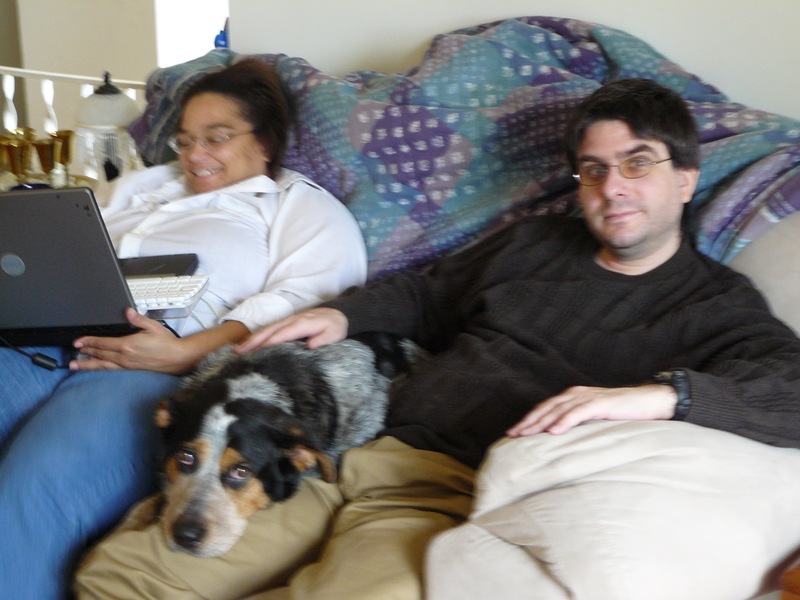 2007-03-21 05:34 UTC – After a few months though, he was settling in and calming down a bit. He was still a bit hyper, but he was part of the family now. And he always wanted to cuddle. 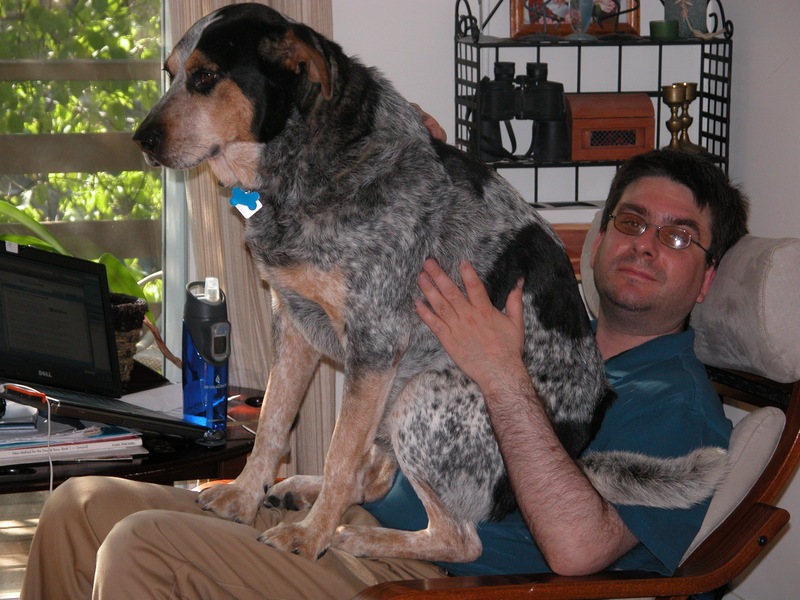 2007-10-14 14:43 UTC – In fact, he was pretty sure he was a lap dog. He never had any idea how big he was. 2007-10-26 17:15 UTC – He would just sit near you and stare up at you with those big brown eyes, looking for attention and love. 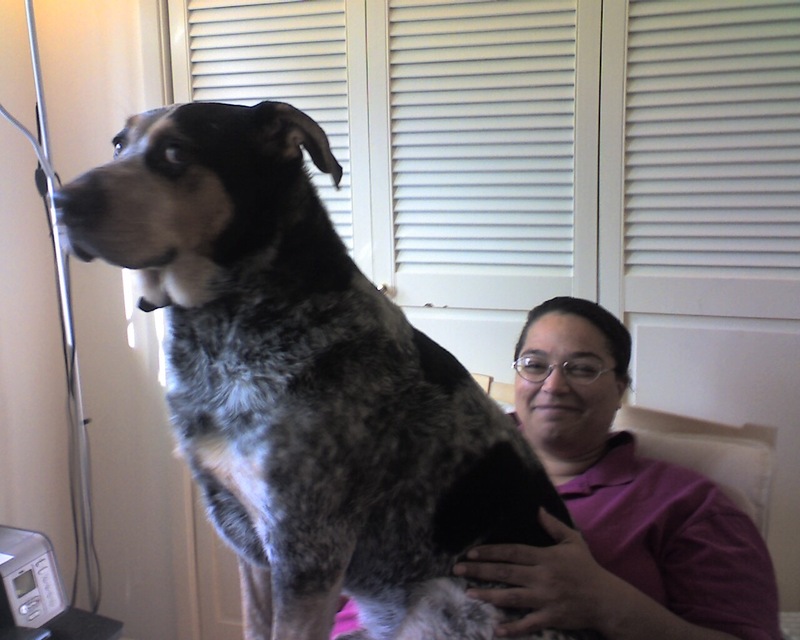 2007-12-14 18:35 UTC – And if he could sit between two of us, so much the better. 2008-08-14 23:43 UTC – Almost two years in, and he still thinks this is an awesome way to sit with us. 2008-11-21 06:48 UTC – There is audio that goes with this picture! Be sure to hit play on the audio player right below the picture! One of the things that Roscoe would do is “sing” with us. Sort of a moan, howl, yodel, mooing sort of thing. It wasn’t every day, every week, or even every month, but every once in awhile he would respond to one of us talking or saying something, then before you know it, we all doing it together. Sometimes we would start it, sometimes he would start it. This isn’t the best example, but is the first one of these we managed to get a recording of. There is a lot of Amy and I making noises too. 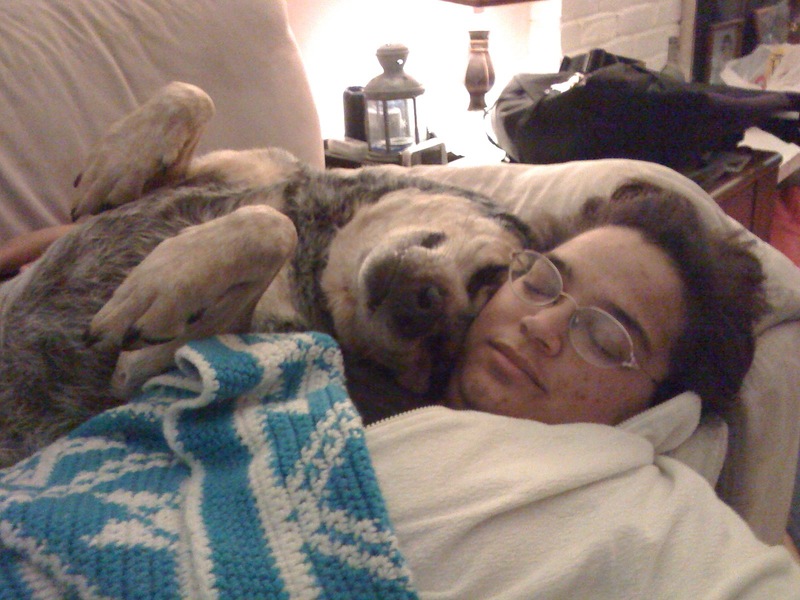 2009-02-25 03:14 UTC – Nothing is better than snuggling with your people. 2009-03-27 07:09 UTC – Roscoe wasn’t the kind of dog who “played” all the time. But every one in awhile he got into a really playful mood and would want to run and chase and be chased. This was one of those times, as he was getting poised for dashing up and down the hallway… and out of the hallway, round and round the living room, always followed by a final mad dash into the back yard. 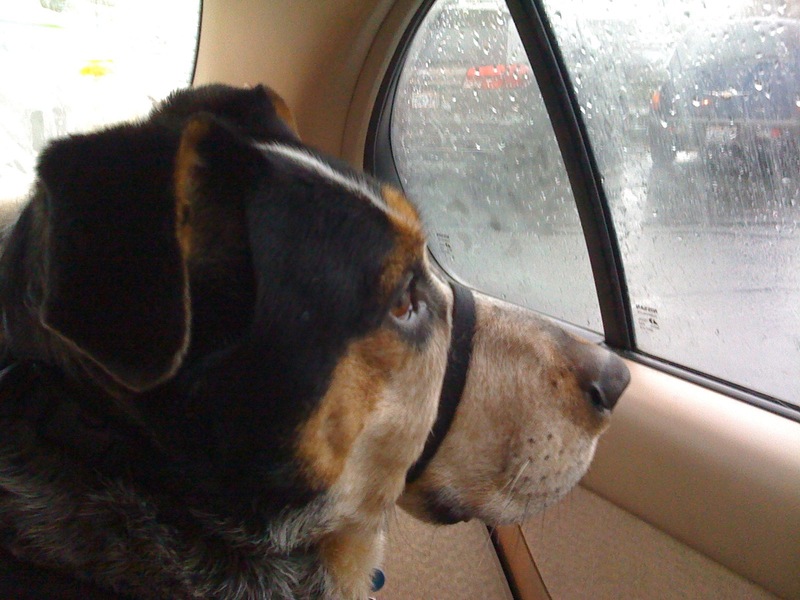 2009-04-02 01:35 UTC – We didn’t do it often, but when we did, Roscoe liked his car rides, and wanted to always watch everything going on outside. As long as we didn’t go on bridges over bodies of water. Water kind of scared him. 2009-04-11 02:00 – Something else we didn’t do nearly enough. Go off to a nice park with Roscoe. He liked it. We liked it. But we rarely seemed to find the time. 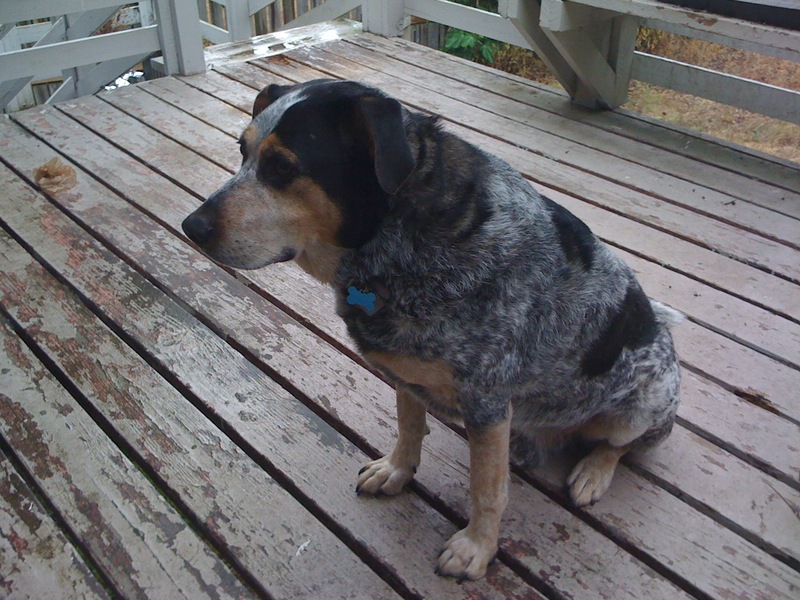 2009-08-14 01:50 UTC – Both at our old house (shown here) and our new house, Roscoe would sometimes just spend hours hanging out on the back porch, checking out whatever was going on. Or looking at the door asking to be let back in. 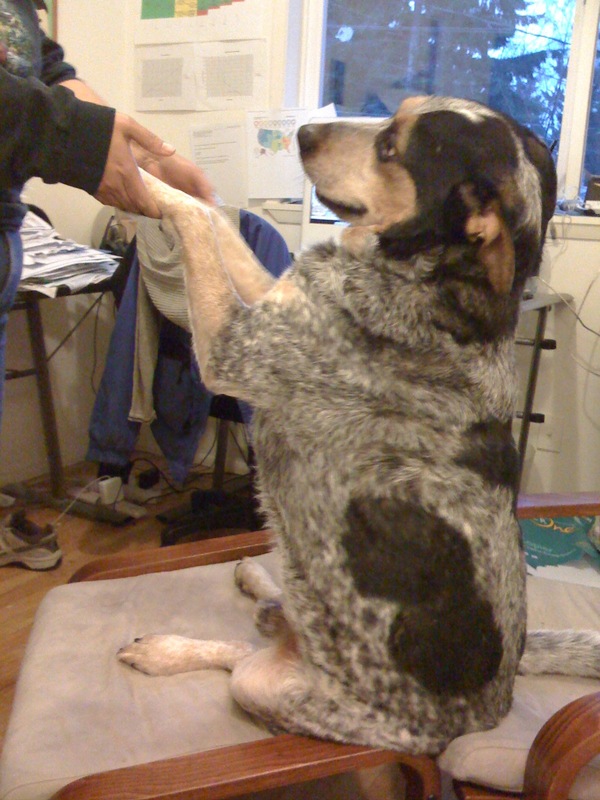 2009-09-09 07:29 UTC – Here he is sitting like a person again. Sometimes he’d just do that. 2009-09-09 15:27 UTC – He loved the big back yard in our old place. He probably spent almost as much time outside as inside. 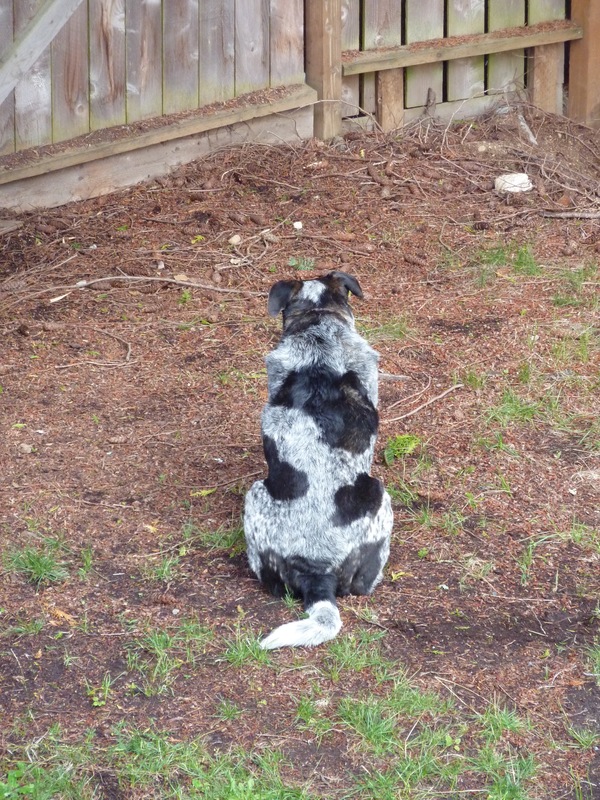 But sometimes he would just sit and stare at the fence. Could never tell what exactly was going on in his head. 2009-09-15 04:17 UTC – And then there was Alex! 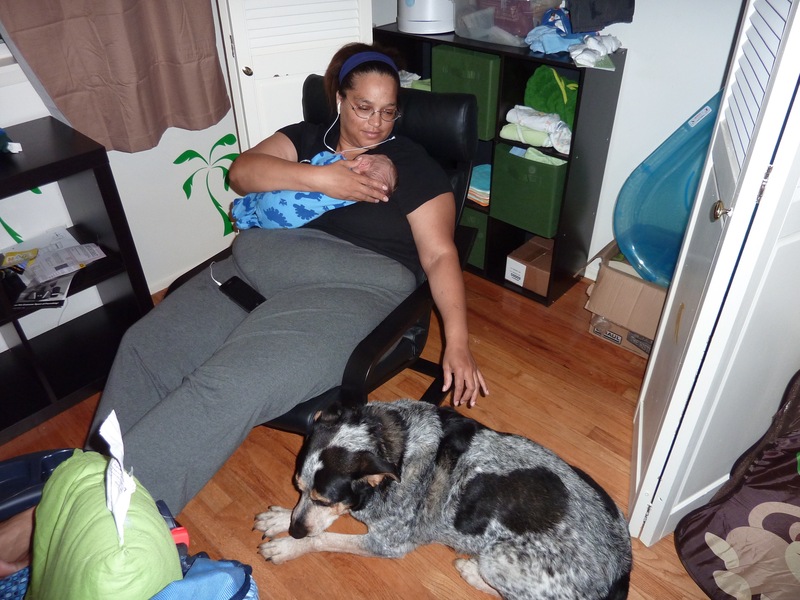 We had told Roscoe that Brandy was going to have a puppy, and he had become very protective of her while she was pregnant, so we think he understood and knew what to expect. This is the first picture i have of Roscoe and Alex together. 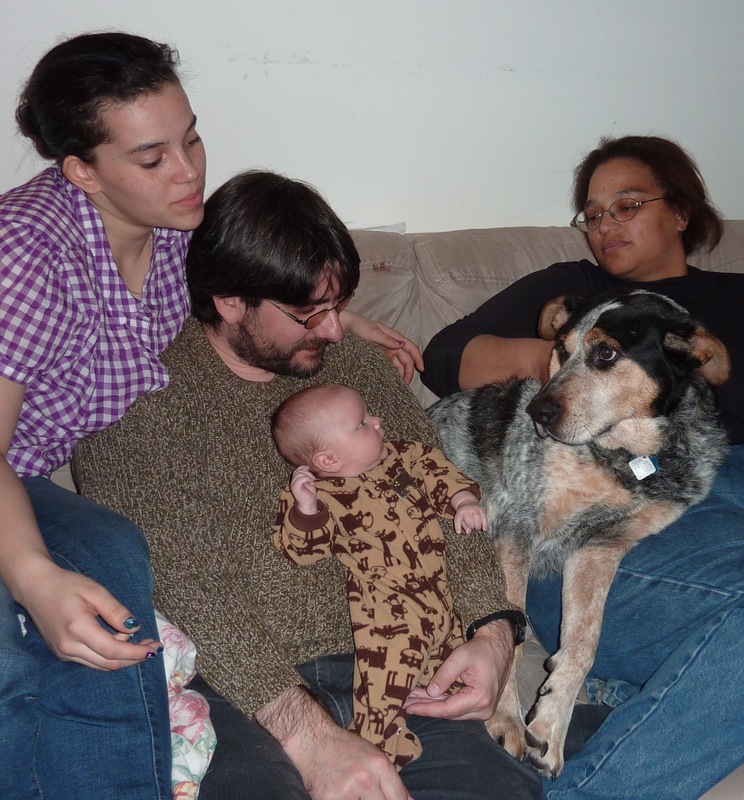 2009-10-23 05:25 UTC – The whole family together. Alex is clearly not quite sure what to think of Roscoe. 2010-01-03 21:12 UTC – Alex still pretty suspicious here. Roscoe tolerating. 2010-04-25 19:48 UTC – Caught while tramping through the back yard. He must have been up to something! 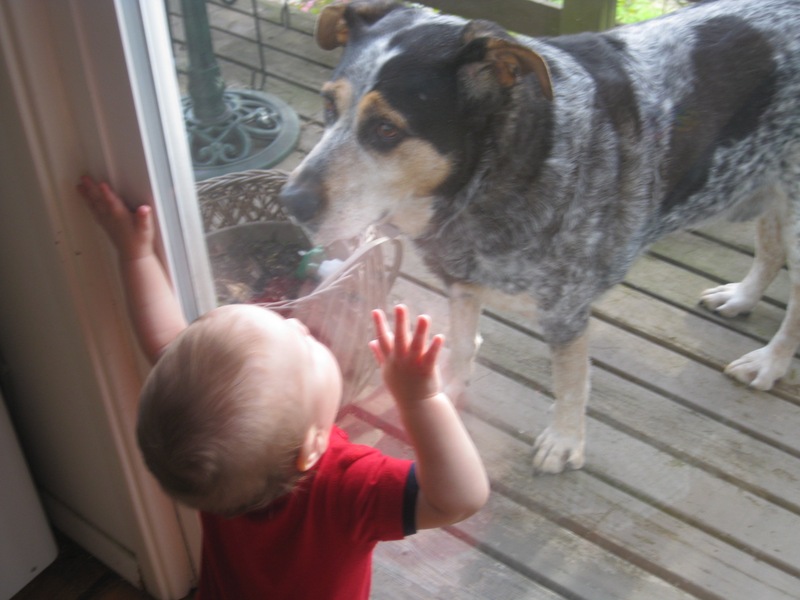 2010-05-13 01:25 UTC – Roscoe wants to be let in. Alex wants to help. But Alex isn’t quite able to operate the door quite yet. 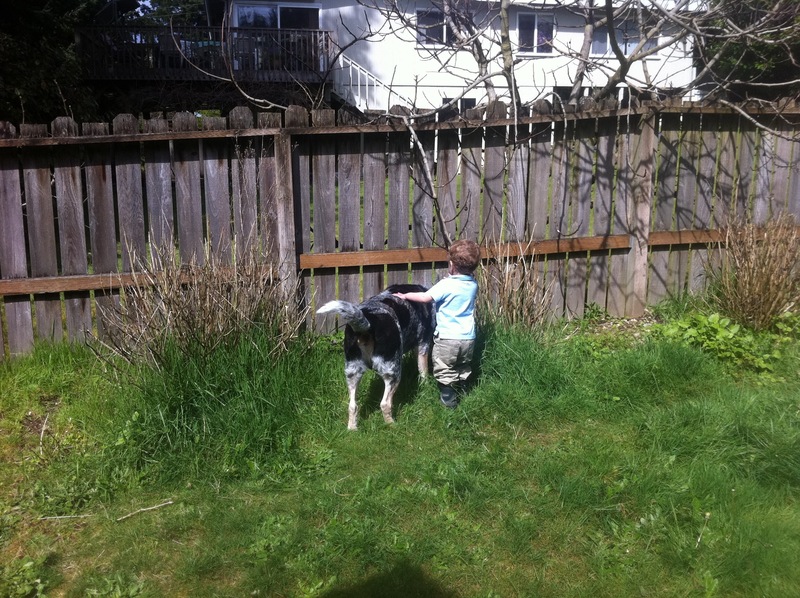 2010-05-23 23:00 UTC – Alex’s curiosity and desire to play with Roscoe is overwhelming. Roscoe allows it. 2010-11-19 ??:?? UTC – The first video I’ve included here. Be sure to press play. Alex thinks Roscoe needs some tissue. 2011-04-24 00:13 UTC – Just chilling together on the back steps. 2011-04-29 16:28 UTC – Alex is about to head down the slide. Roscoe watching out for him as usual. 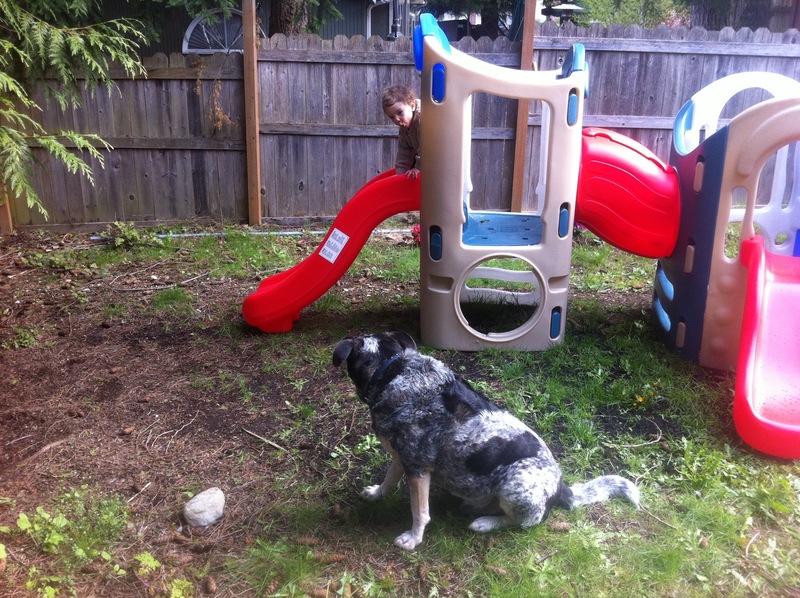 2011-05-08 22:21 UTC – They would often explore the backyard together. 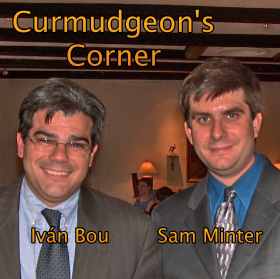 2011-05-22 00:51 UTC – Partners in crime. This was the bin where all the dry dog food was kept. Alex’s job that he did almost every night was give Roscoe two scoops from the bin. Into roscoe’s bowl. 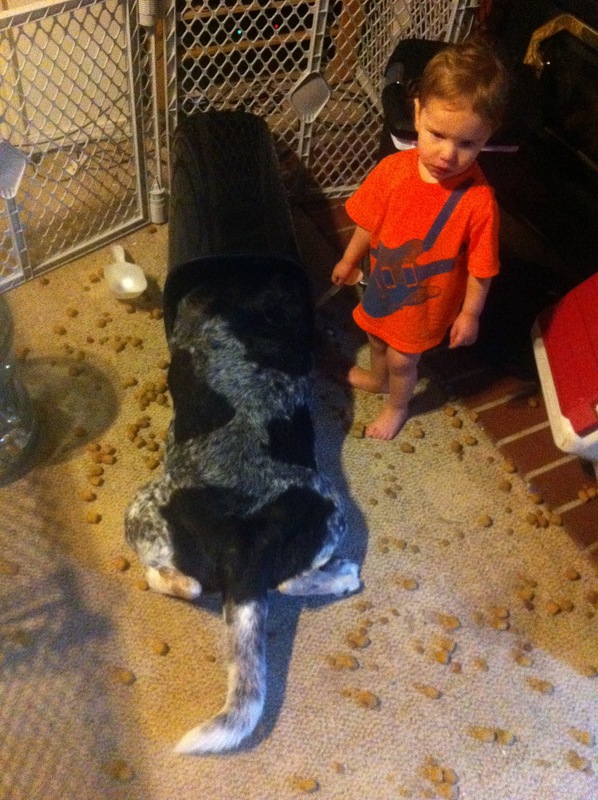 But this night, they conspired together and opened and knocked over the bin so Roscoe could have as much as he wanted. 2011-07-25 01:30 UTC – The first of several videos in a row now. 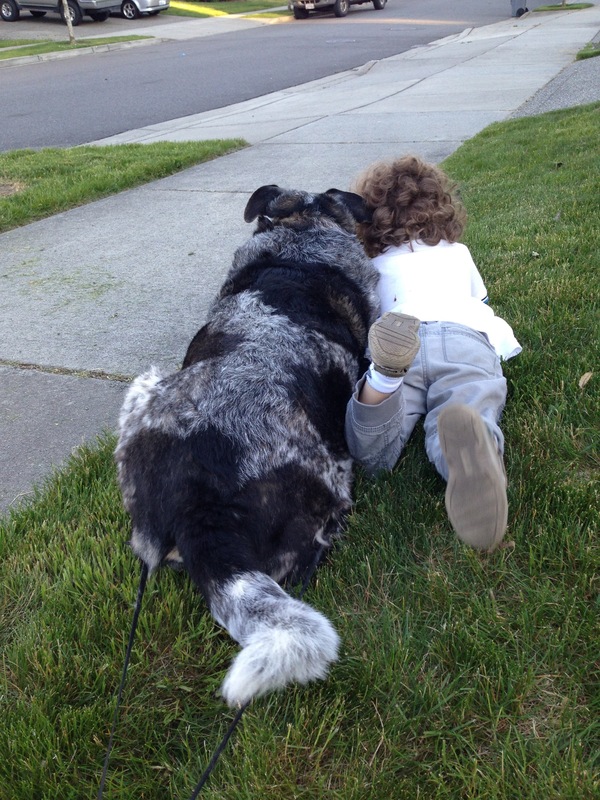 Roscoe and Alex play together in the grass. 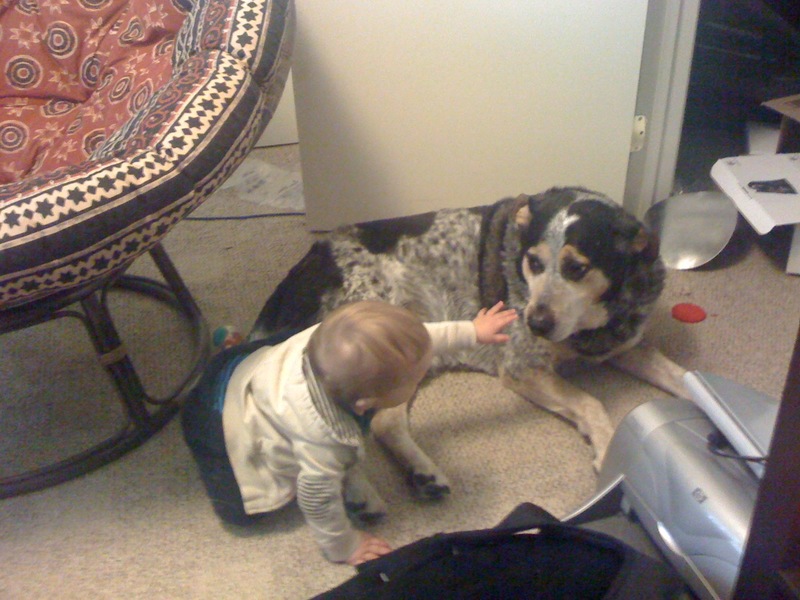 Well… Alex tries to play with Roscoe. 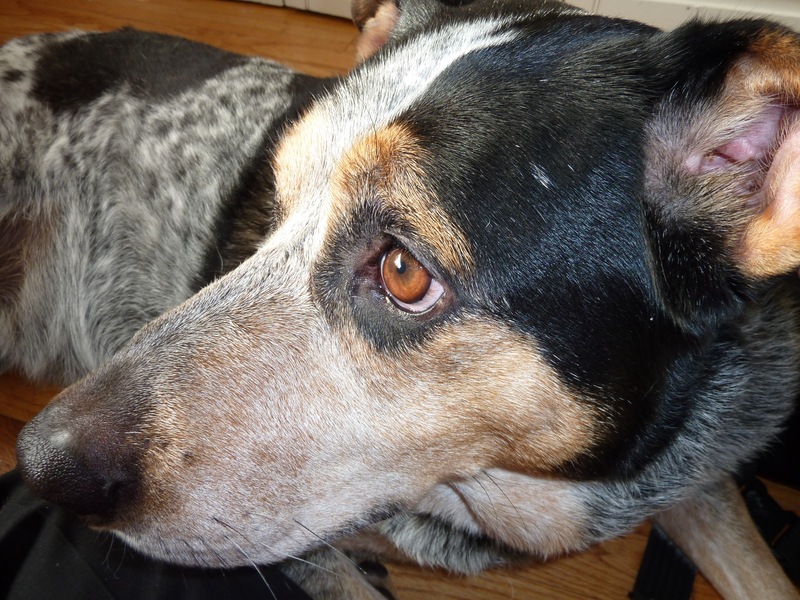 Roscoe remains aloof and eventually walks away. 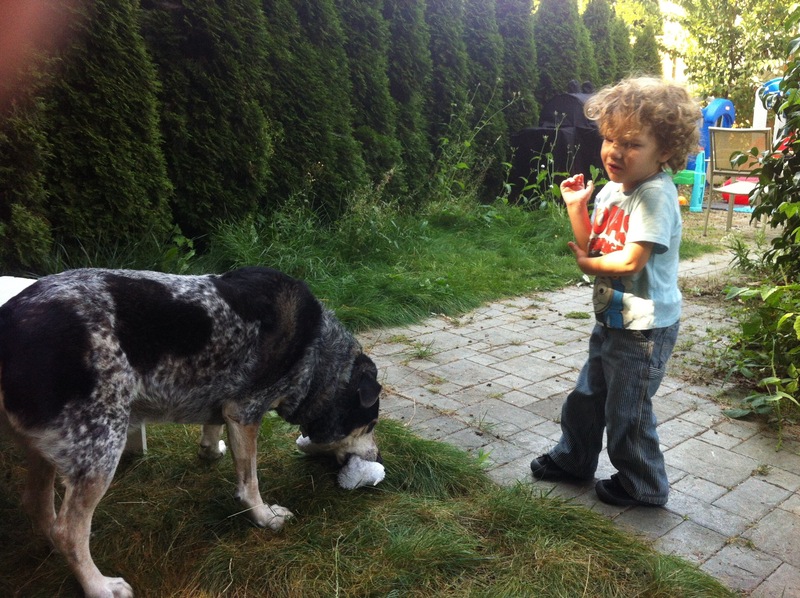 2011-08-05 19:40 UTC – Alex discovers the hose. Which Roscoe loves to attack. Which is just so funny! 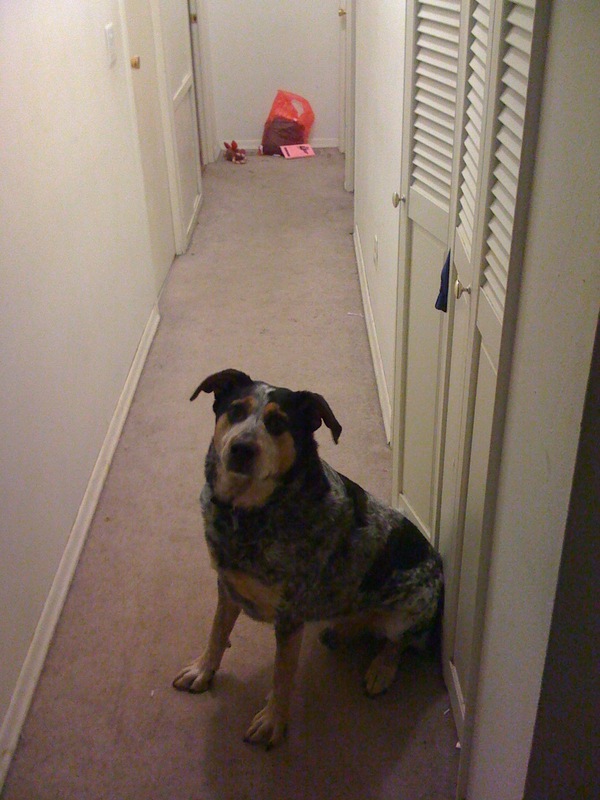 2011-09-24 15:18 UTC – Now at our new (current) house, Roscoe gets to walk the dog for the first time. 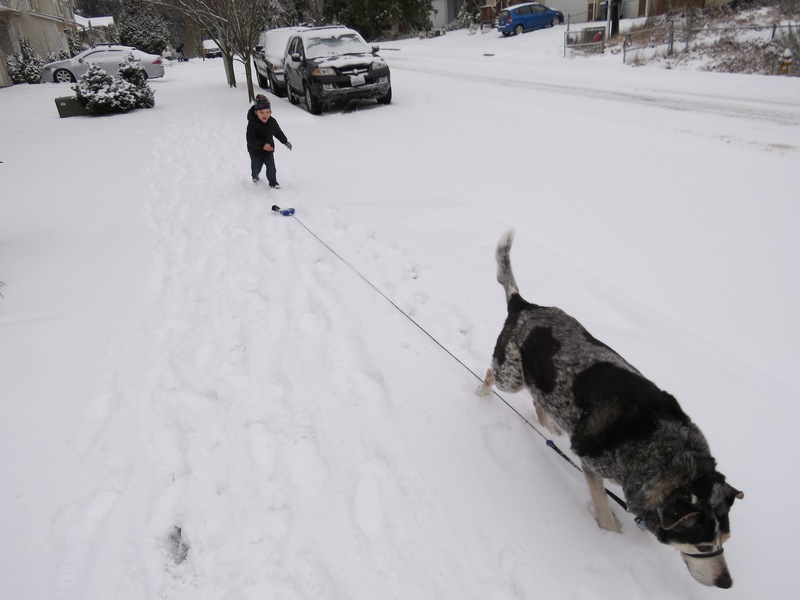 At first, and for a long time, we used two leashes. One for Alex to hold, and one that I or another adult would hold. This worked very well and Alex loved it. Roscoe was fine with it too. He didn’t care, he got his walk! 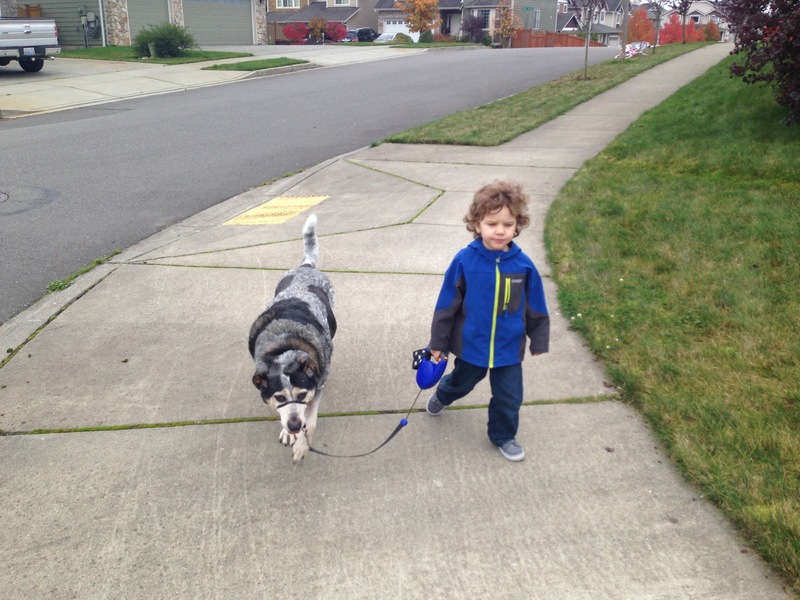 From this point for quite a long time, one of Alex’s favorite activities was walking Roscoe. Since Roscoe had a fenced back yard, he often just did his business there, so walks were not as regular or as often as they should have been. But when we did walk, everybody enjoyed it. 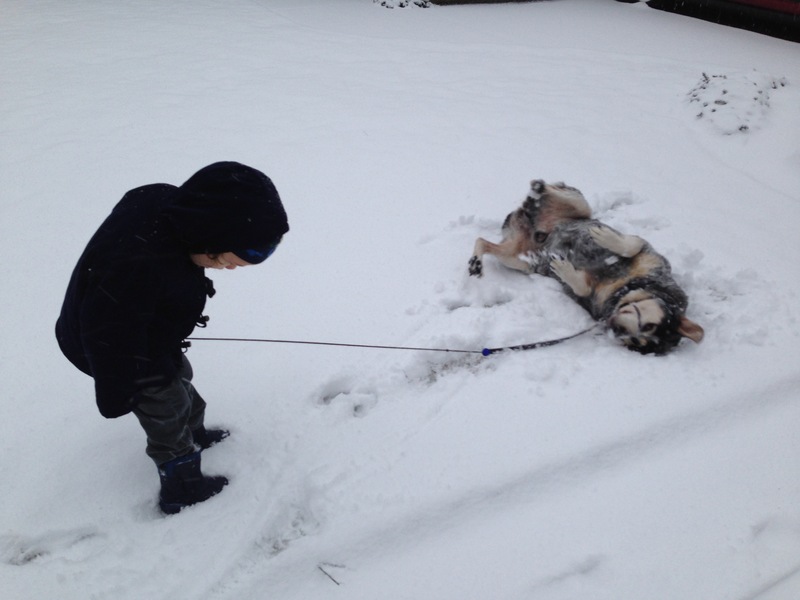 2012-01-17 17:12 UTC – Playing in the snow would soon become one of the favorite things Alex and Roscoe would do together. In the first of these in our new house, Roscoe and Alex started out in the back yard checking everything out. But Roscoe was done before Alex was. 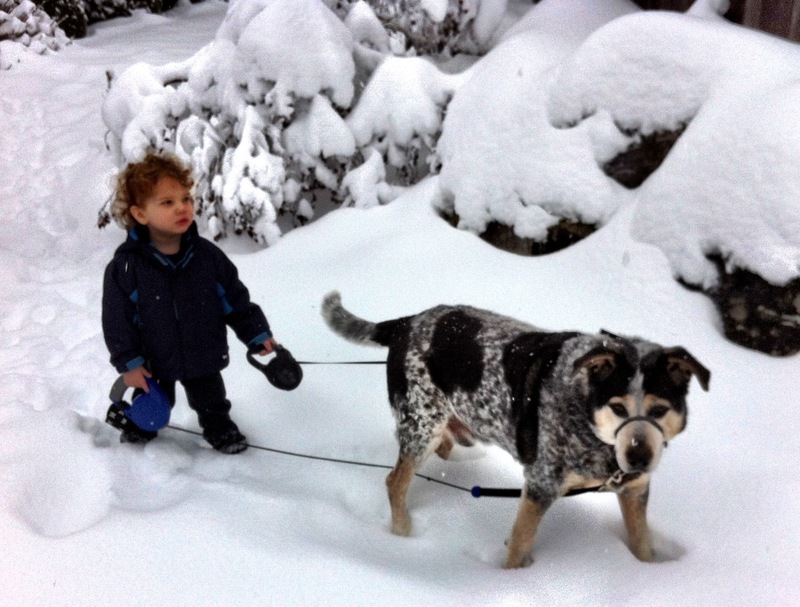 2012-01-19 20:25 UTC – On a quiet snowy day, with everything shut down, Alex takes charge of BOTH leashes! 2012-05-13 17:35 UTC – A few months later in the Spring, he would sometimes even go solo with just one leash! Under close supervision of course. But Roscoe was almost always very good and followed Alex’s lead and didn’t pull or run. Uh, unless he saw another dog. Then Daddy would insist on taking over. 2012-07-18 04:24 UTC – Oooh! Grandma Ruth visiting! Roscoe’s favorite person who didn’t live with us! 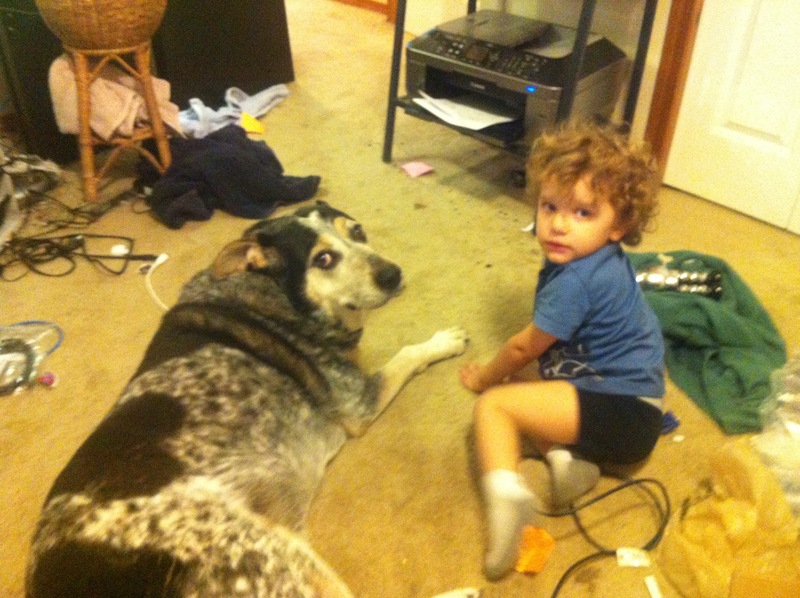 2012-07-24 21:24 UTC – Roscoe would stick close to Alex, even when Alex was busy playing with his trains. 2012-07-31 15:12 UTC – Another ride in the car! He was going into the vet for a little bit of surgery, but he came out just fine! 2012-08-26 22:28 UTC – Roscoe very rarely played with toys, but this was one of those times. Alex would throw the squeaky bone and Roscoe would go get it. He never learned the bring it back part of fetch, but would give up the bone when someone kept to take it. Sometimes after a little playful keep away. Alex and Roscoe tossed around the bone for several minutes. Then Roscoe was done. 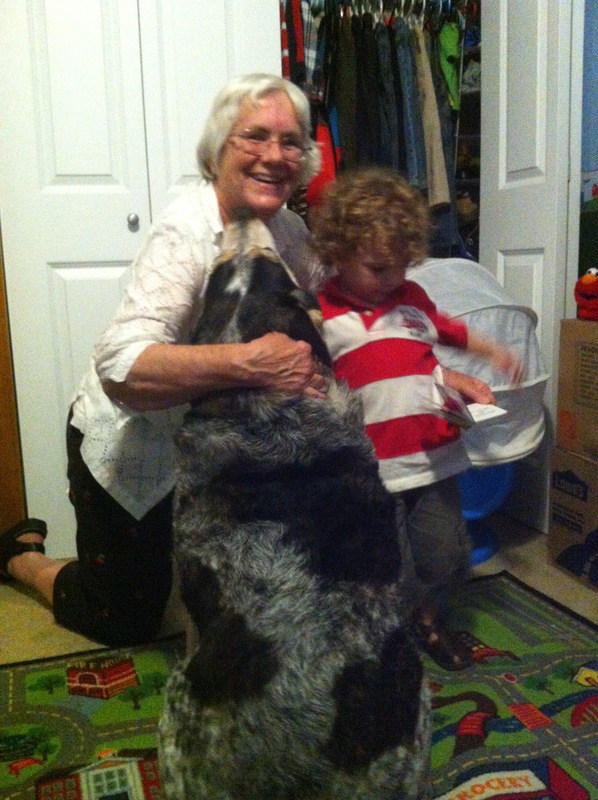 2012-08-28 06:57 UTC – Excited that Grandma Leslie is visiting and paying attention to him. 2012-09-02 19:32 UTC – Um… Alex decided that when Roscoe licked him, the right thing to do was lick back. After all, that is how dogs kiss. 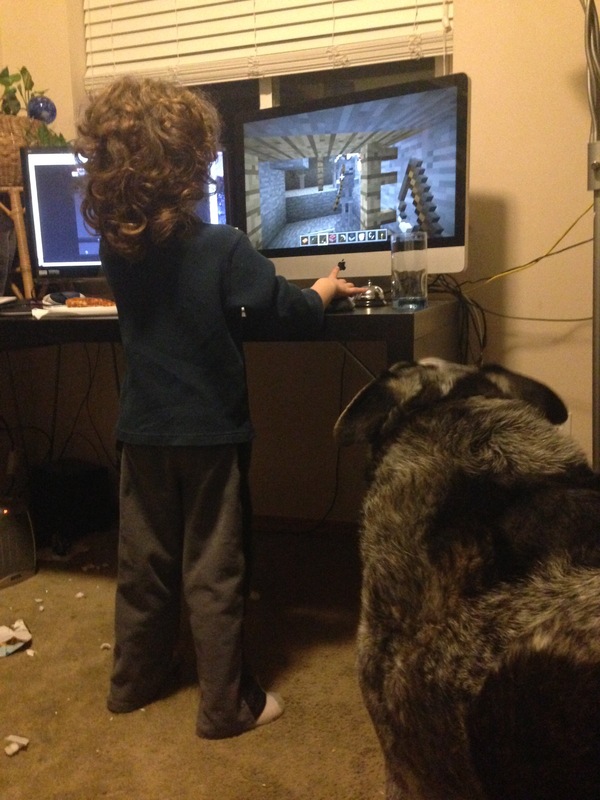 And he was going to pretend he was a dog too. He also extended this to be how he tried to greet people. This was not always appreciated. “Daddy, lick our tongues together like I do with Roscoe!” Uh, no. No thanks. Really. 2012-09-20 06:12 UTC – I don’t know exactly what was going on here when I caught them, but they were clearly up to no good! 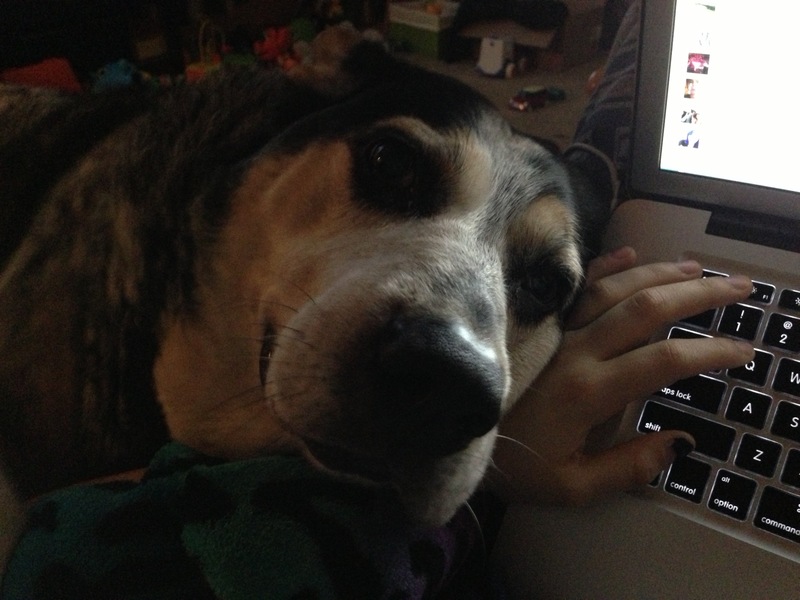 2012-12-05 02:48 UTC – When Amy sits down to work on her computer, Roscoe decides that would be a good time to cuddle on her hand. 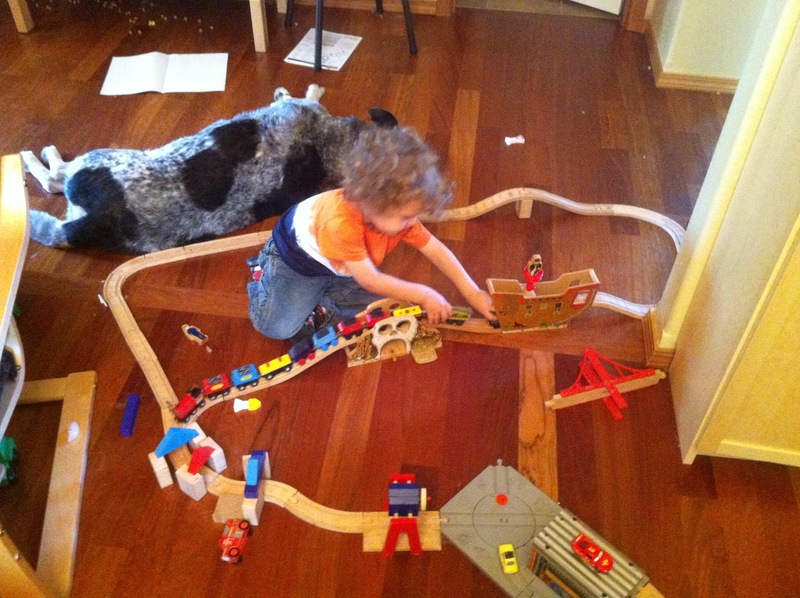 2012-12-19 05:46 UTC – Sometimes Roscoe wanted to get just a bit TOO involved in playing with trains. 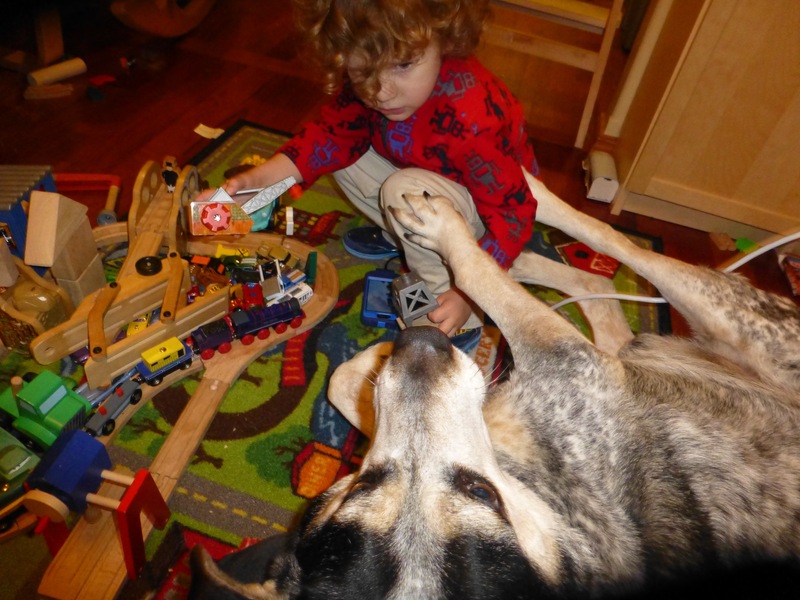 Alex complained Roscoe wouldn’t play right and would try to shoo him away, or put obstacles in the way so Roscoe couldn’t walk over and lie down on top of the trains. But Roscoe often did anyway. 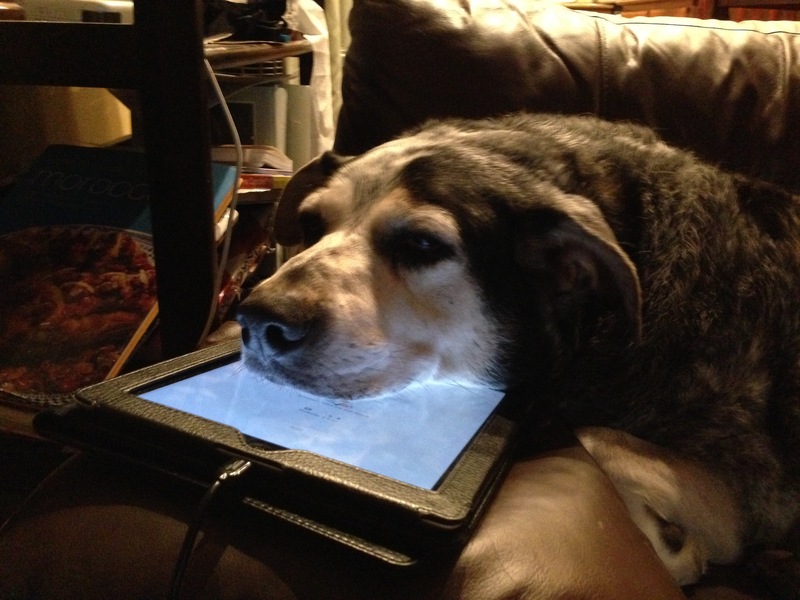 2013-03-26 03:43 UTC – Squishy dog face. Alex and Roscoe both comfy on Mommy’s lap. 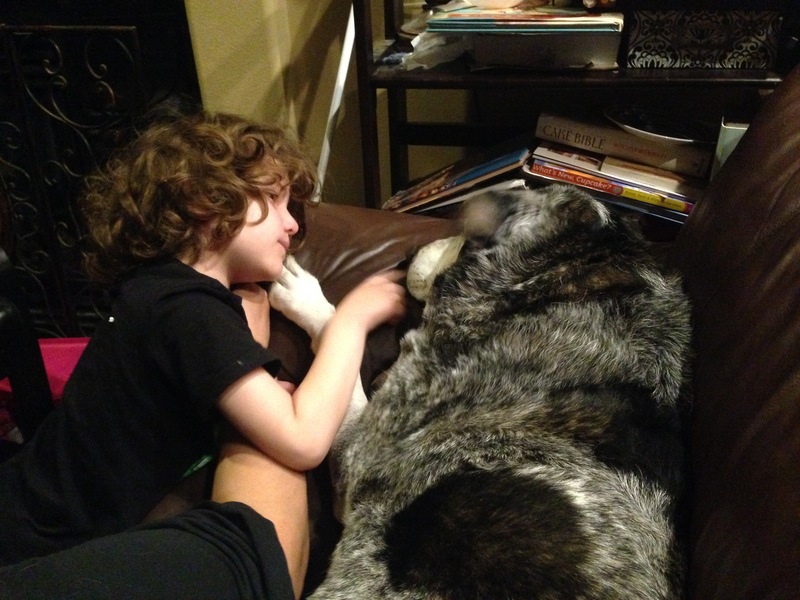 2013-06-04 02:57 UTC – A boy and his dog. You can’t even see their faces, but I think this is my favorite picture of the whole bunch. It just captures the closeness of Roscoe and Alex’s relationship perfectly. In one of their good moments. They really were best friends. 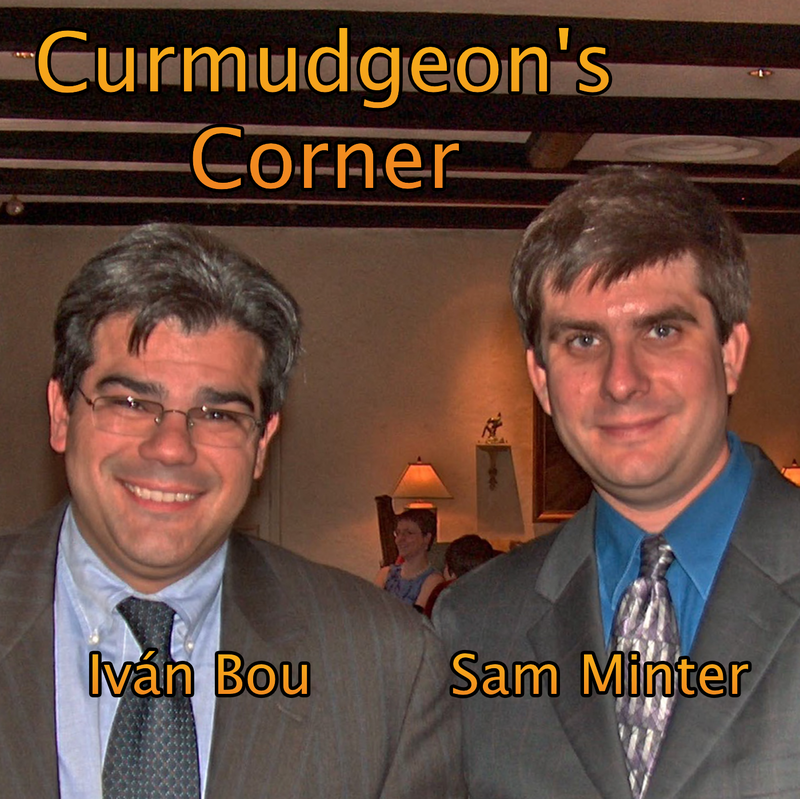 2013-08-05 05:23 UTC – Of course, seeming them being friends from the front is nice too. 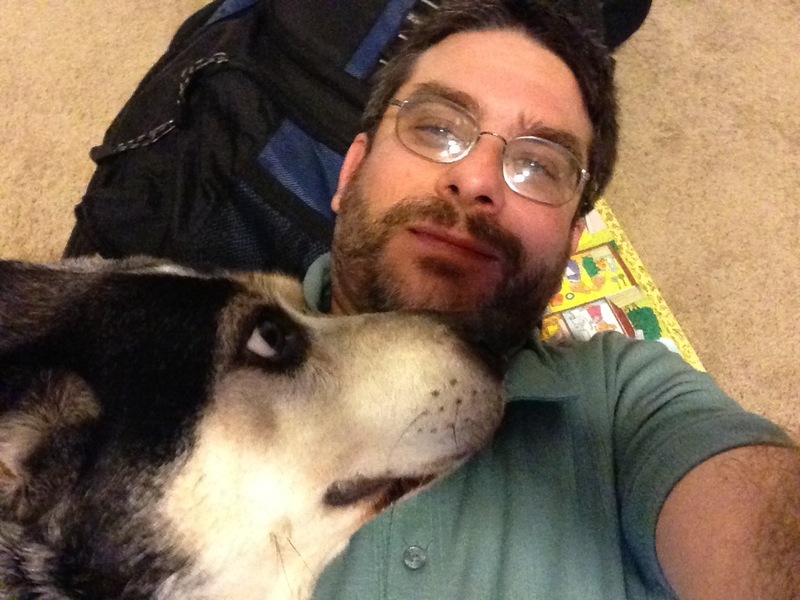 2013-09-12 06:36 UTC – I have a lot fewer pictures of Roscoe and me together. But when he got a chance, he really liked to cuddle with me too. 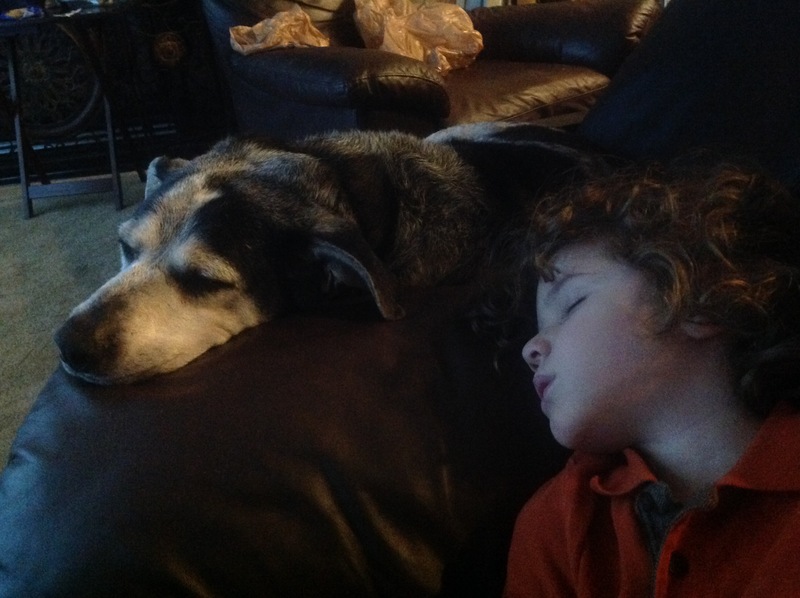 2013-10-26 21:15 UTC – Sometimes walking the dog is less exciting than others. 2013-12-20 17:17 UTC – More snow! One of Roscoe’s absolute favorite things was rolling in the snow. The deeper the better! He would just jump in and roll, roll, roll! 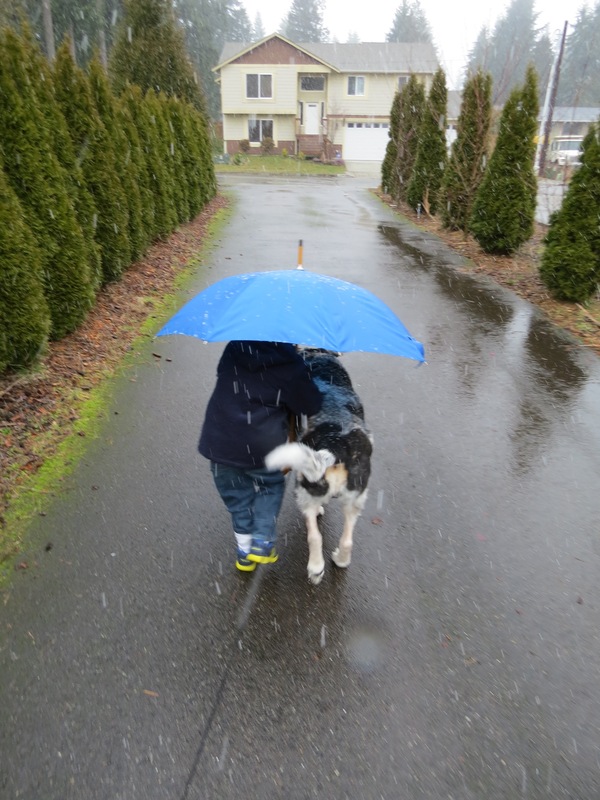 Alex would talk all summer about how important it was that we get snow and walk Roscoe in the snow. To the point where in years where it looked like we might not get real snow, we started to make plans to take Roscoe up to the mountains for that walk. We never had to do that, but a couple years it came close! 2013-12-20 17:19 UTC – A video this time, of a nice walk in the snow! 2014-02-09 17:49 UTC – Sometimes when you are walking the dog, you drop the leash and have to run to catch it! 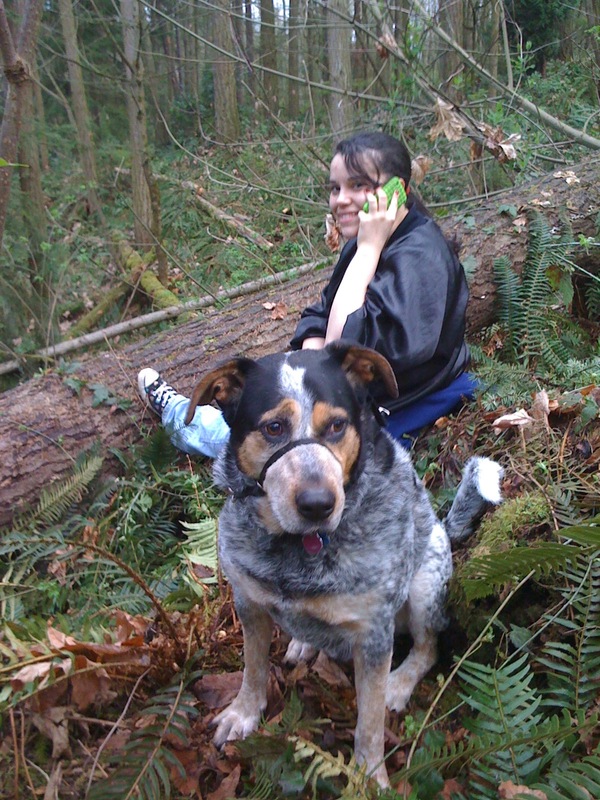 Roscoe hadn’t made a run for it in a dropped leash situation since 2006 though, and even when he’d occasionally let himself out for a walk, we’d find him idly walking nearby, almost always on one of our usual walking routes, and he’d come running when called. 2014-03-12 00:15 UTC – Just a nice pic. 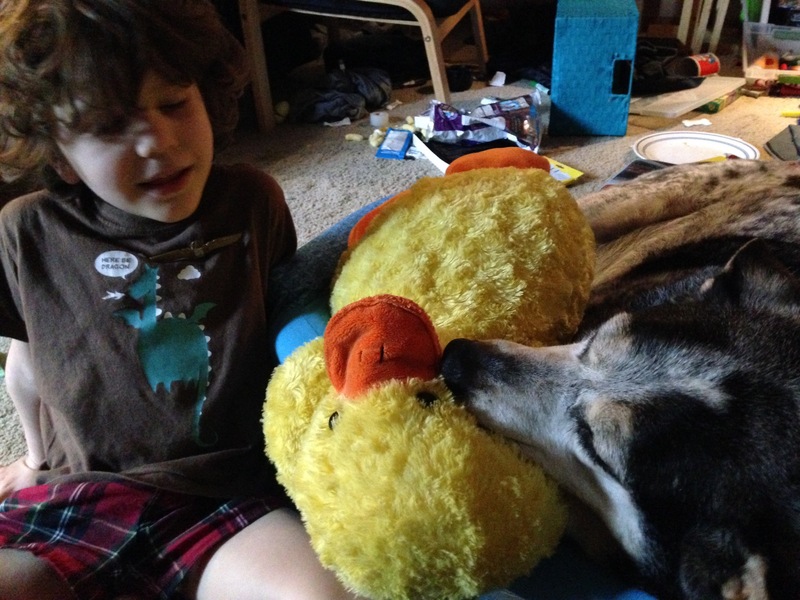 2014-03-16 20:47 UTC – Sharing Ducky. 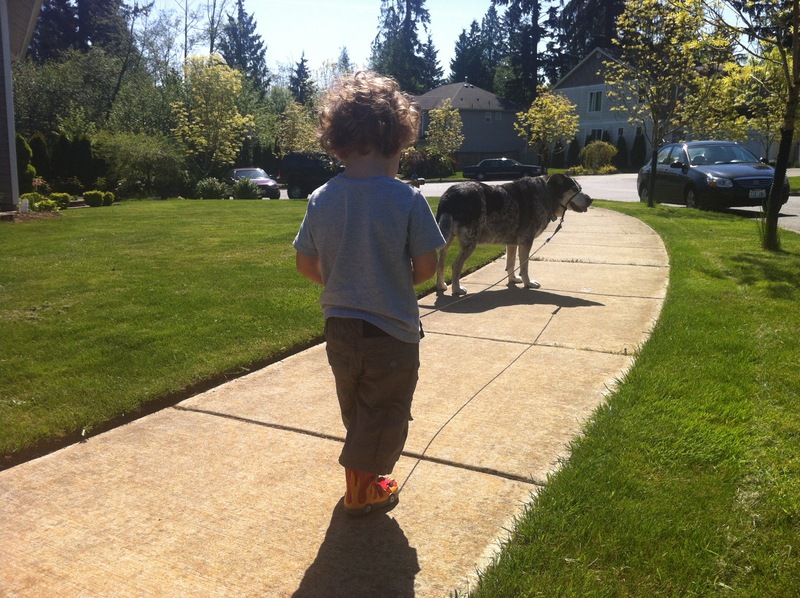 2014-04-09 01:14 UTC – Forget about WALKING the dog, it is time to RUN! 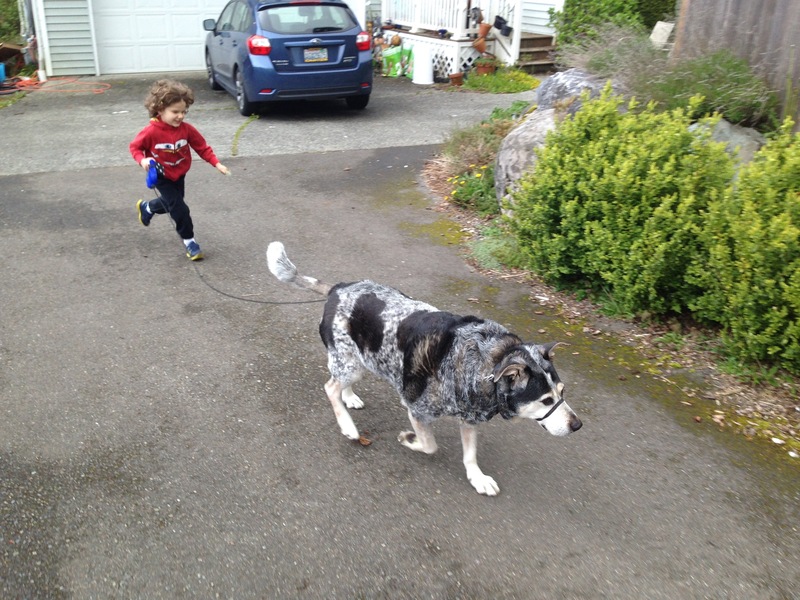 2014-04-27 23:47 UTC – More running with the dog! 2014-05-13 20:06 UTC – Big hug! 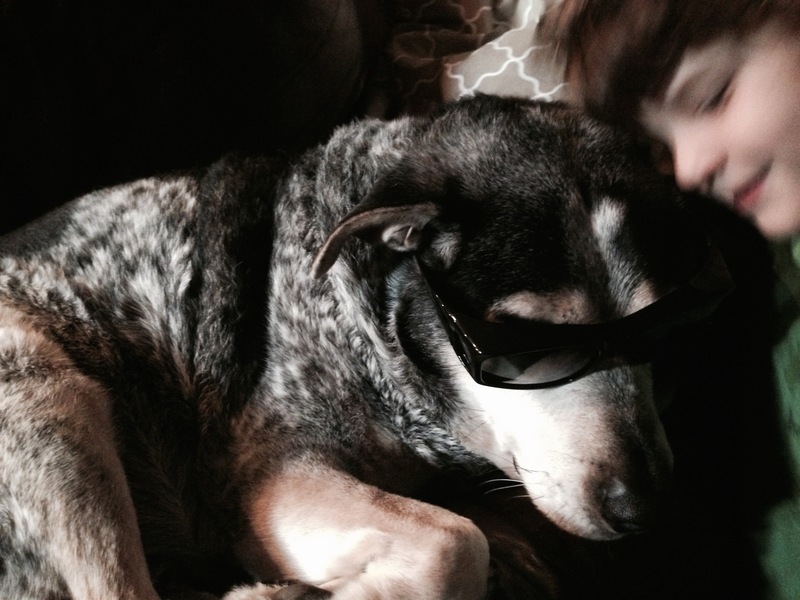 2014-05-27 03:07 UTC – Looking cool wearing those sunglasses! 2015-06-23 01:11 UTC – Limbo!! 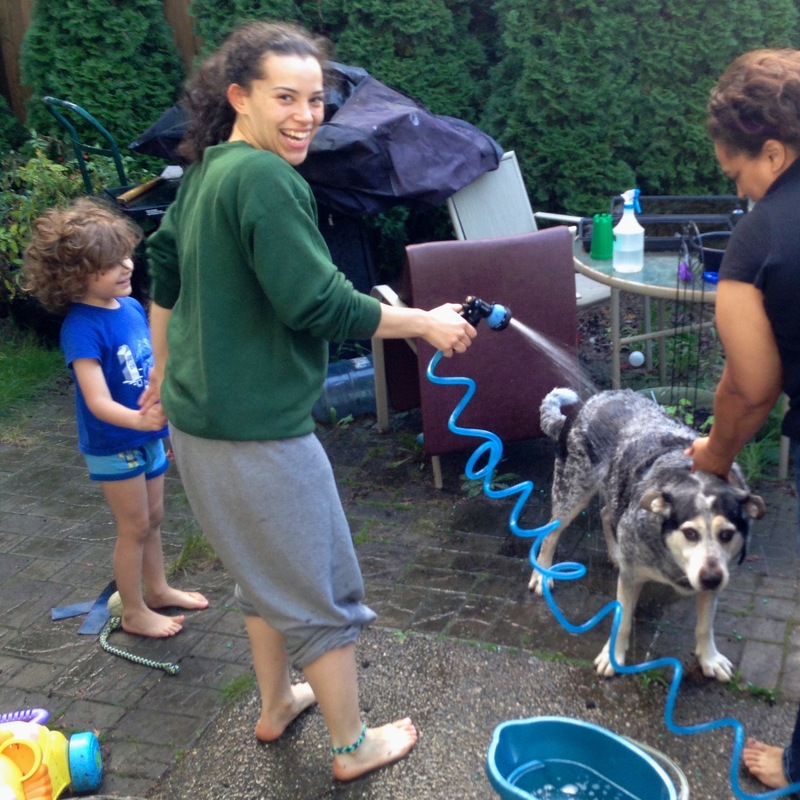 2014-06-29 23:31 UTC – Alex was pretty sure washing the dog would be great fun. Roscoe was pretty sure it would not be. 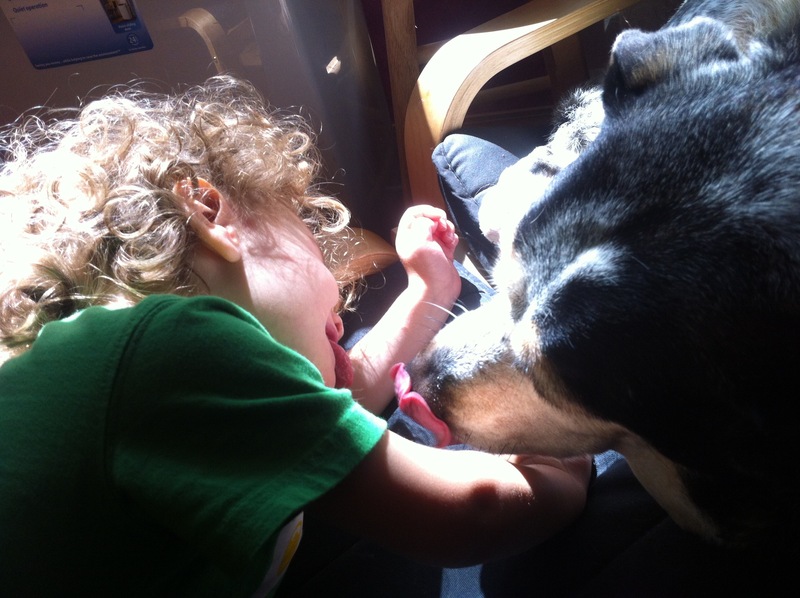 2014-07-20 00:20 UTC – A nice lick on the mouth for his boy. 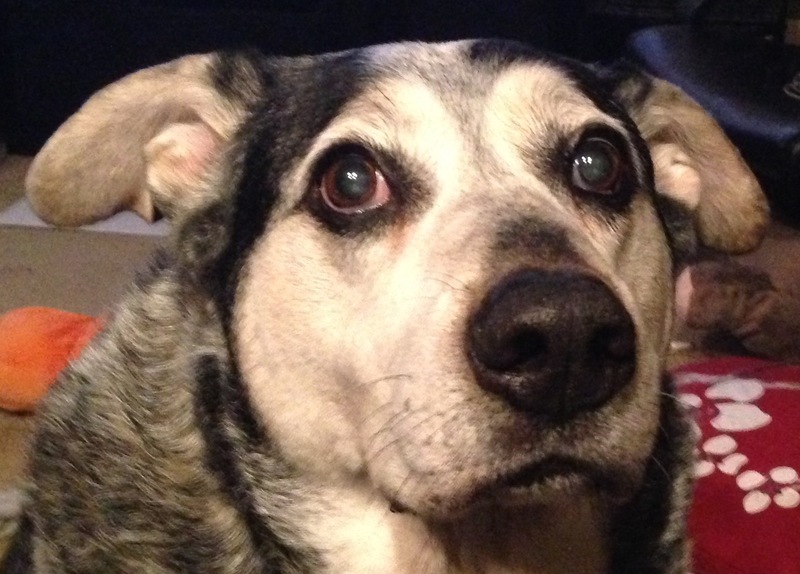 2014-07-25 19:57 UTC – Alex sings with Roscoe for awhile, then leaves and fetches the leash to invite Roscoe for a walk… upstairs… to get me. We went for a walk immediately after I stopped recording. 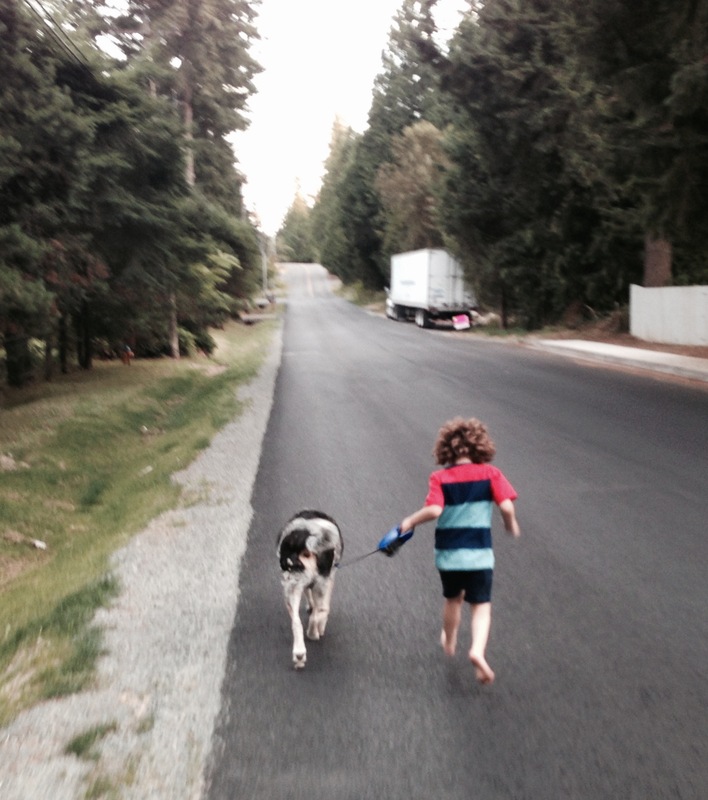 2014-08-02 03:06 UTC – Friends trotting down the street together barefoot. 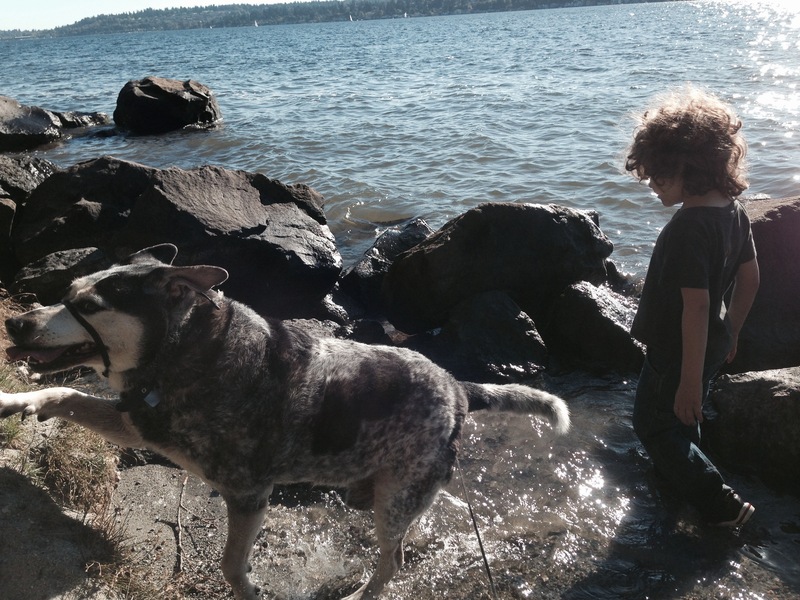 2014-09-20 23:22 UTC – When we got him, Roscoe was afraid of water. Especially lakes and streams. 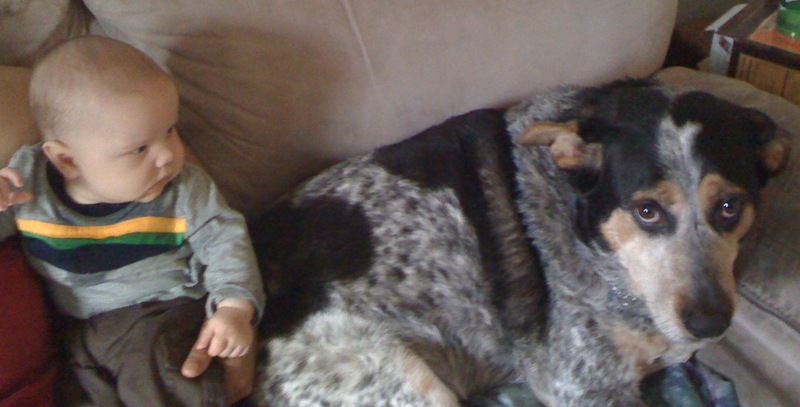 Later he would tolerate going near them if he had to. But he would never PLAY in the water. Until we went on a hike to a nearby lake and Alex asked him to play. “Come on Roscoe, come in!” Alex and Roscoe frolicked in the water together at the edge of the lake for a couple minutes. I was so shocked that I didn’t manage to get a picture until Roscoe was done and jumping out. 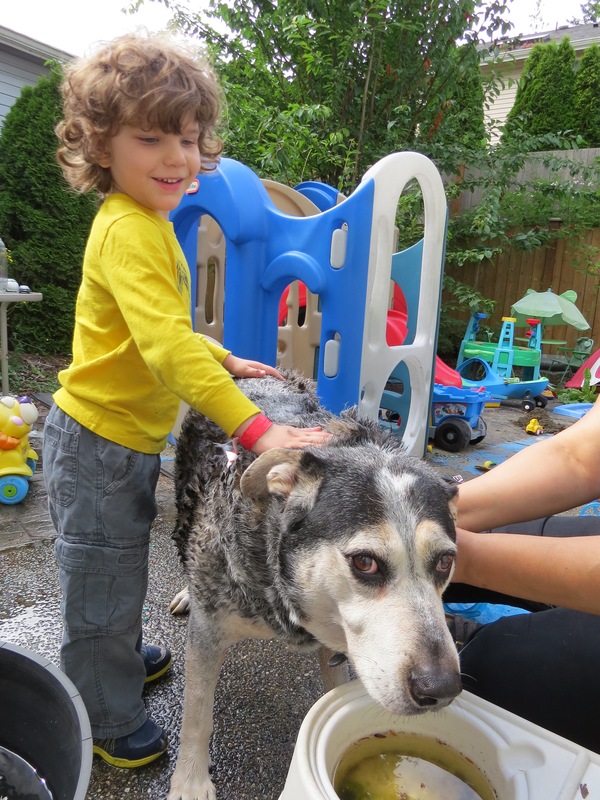 2014-10-05 00:23 UTC – Time for another bath for Roscoe! Uh, sorry. Shower. Alex was very particular that this was a shower and not a bath. 2014-10-14 06:39 UTC – We would find them like this SO often. 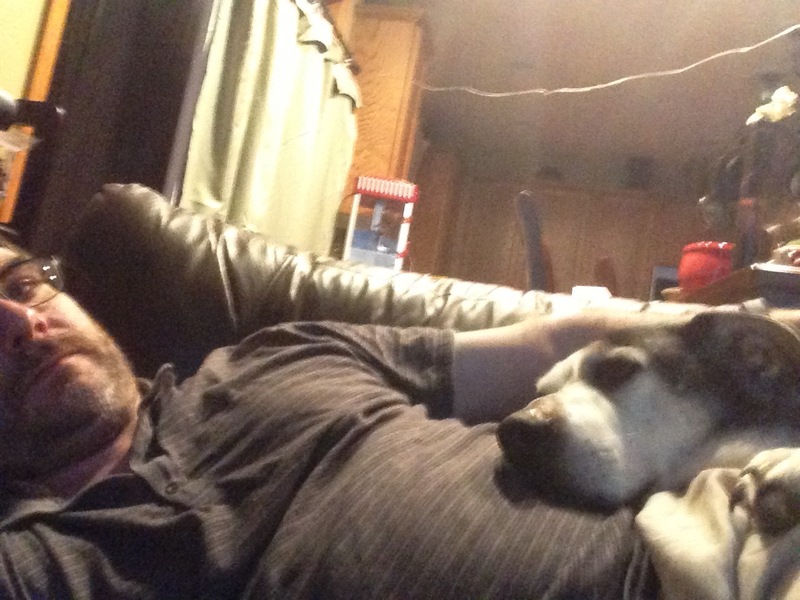 2014-11-24 04:44 UTC – Just hanging on the cough with Brandy and Alex. 2014-11-29 18:14 UTC – Lick, lick, lick. 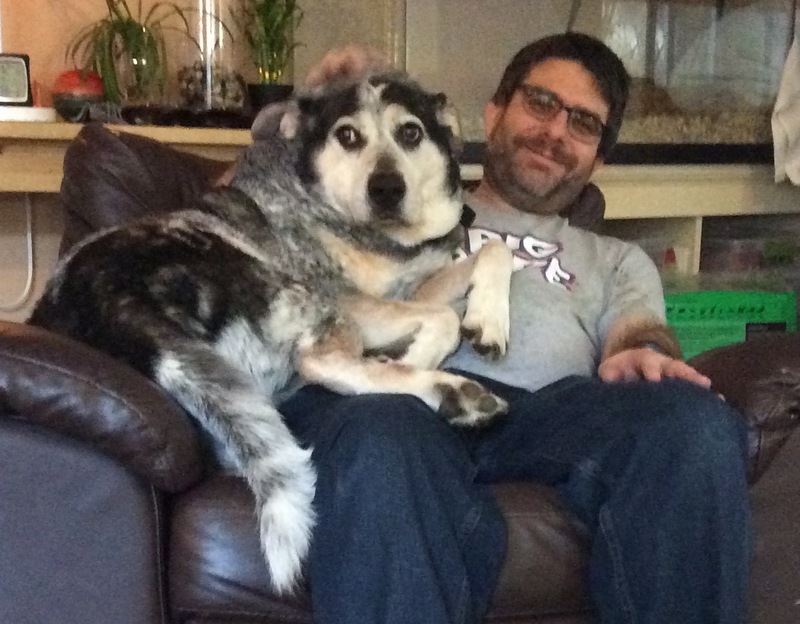 2014-12-07 20:32 UTC – Sitting with Daddy. 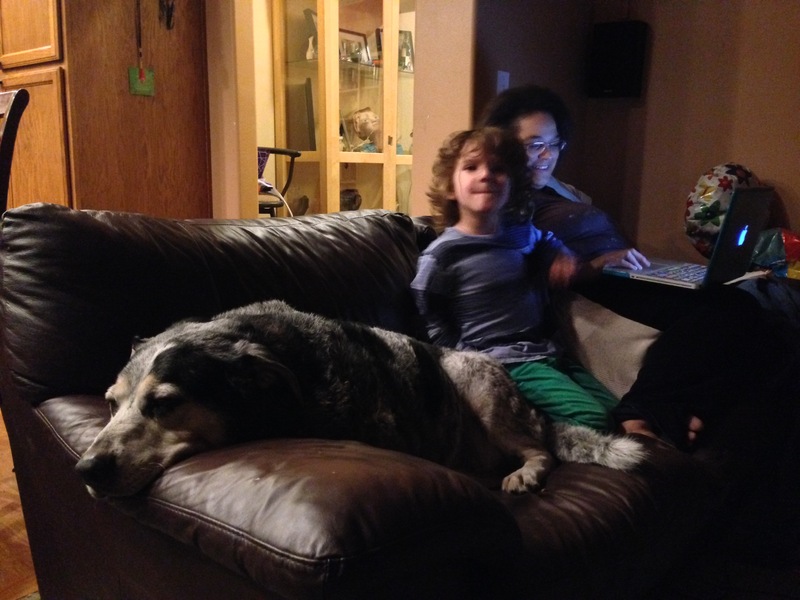 2014-12-07 20:38 UTC – Alex wanted in on the picture too, but Roscoe was getting tired. 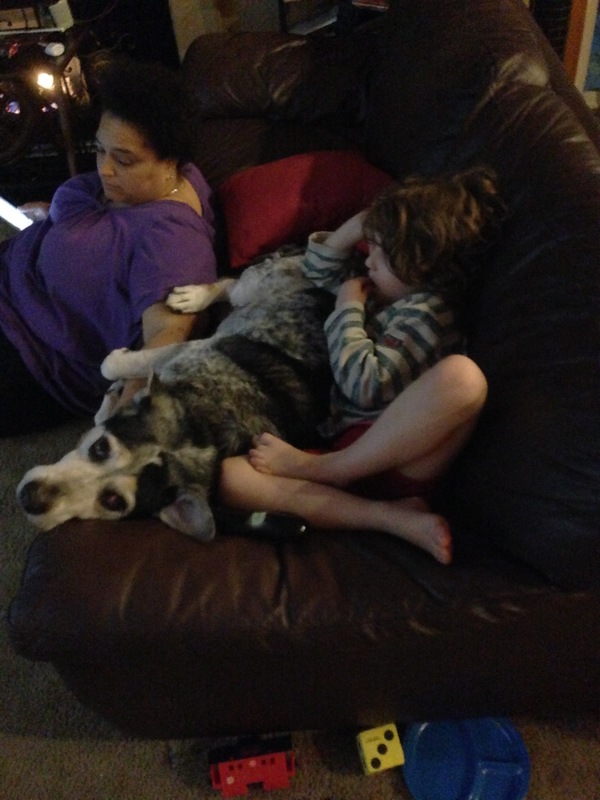 2014-12-31 06:33 UTC – More just hanging out on the couch. This happened a lot. It was always cute. 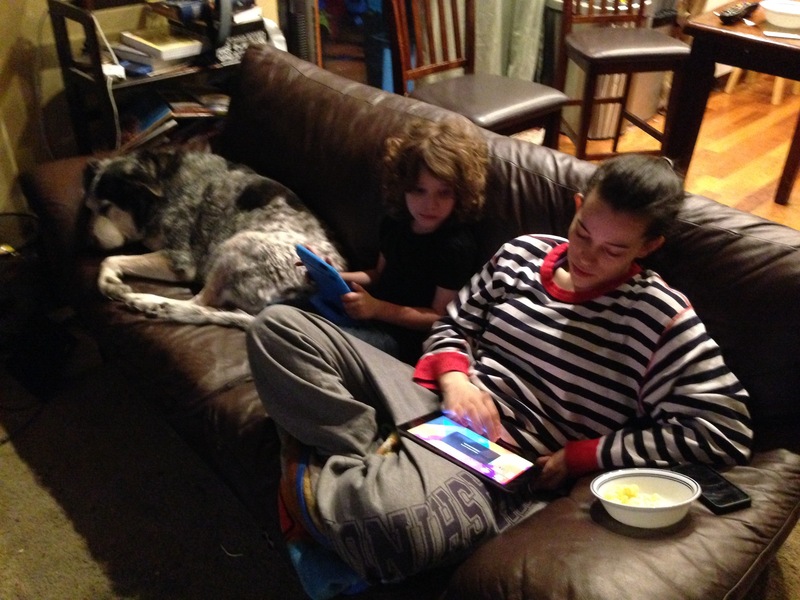 2015-01-12 05:54 UTC – Amy gets couch time with Alex and Roscoe too. 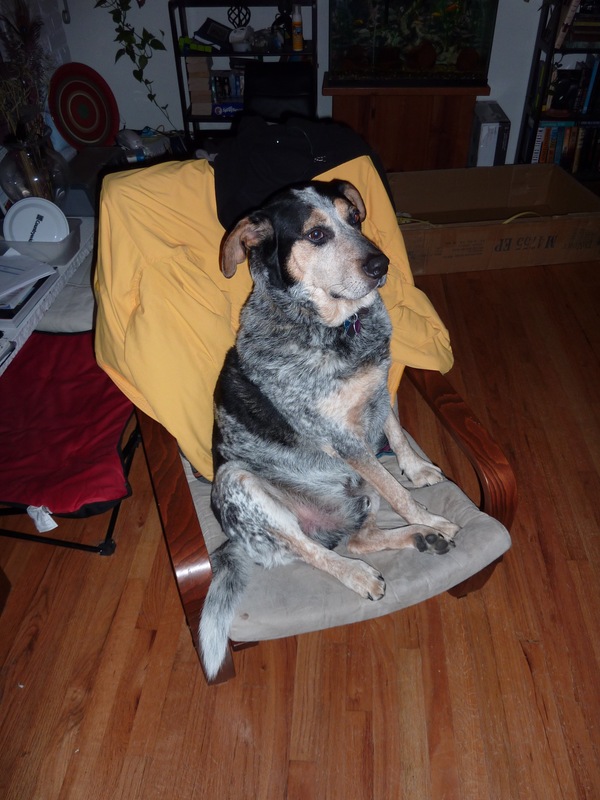 2015-01-12 21:09 UTC – Years later, this was STILL Roscoe’s favorite chair. 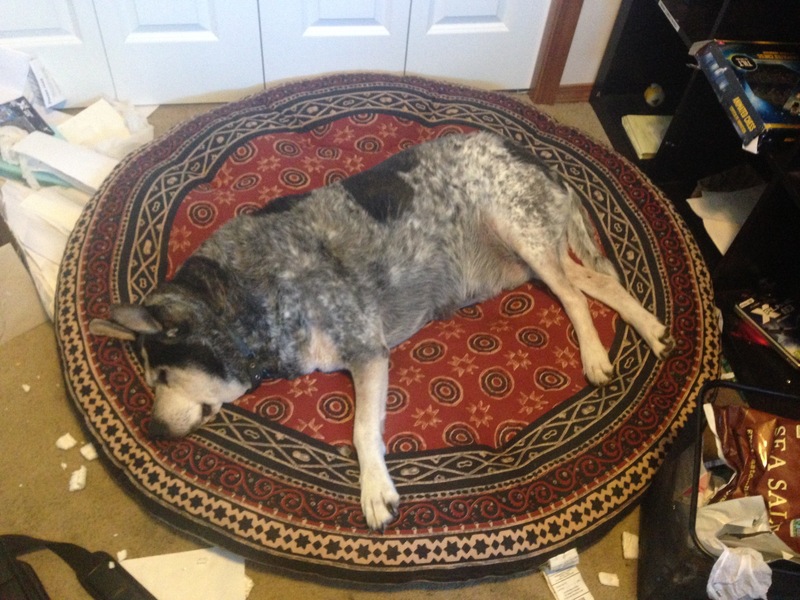 But as he got older, it was harder for him to jump up into it, so I gave it to him as a bed. 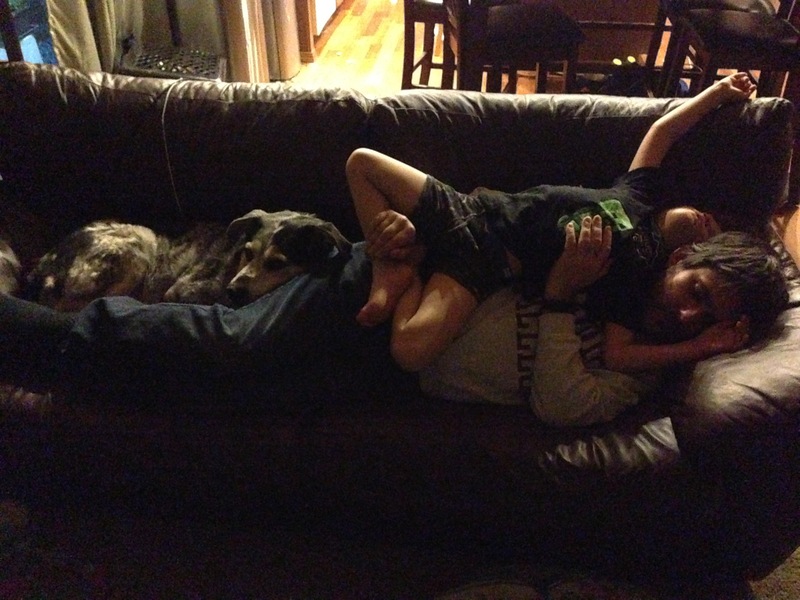 2015-01-22 09:33 UTC – Amy caught this middle of the night picture of Roscoe, Alex and me all fast asleep in a big puppy pile. Just the way Roscoe liked it. 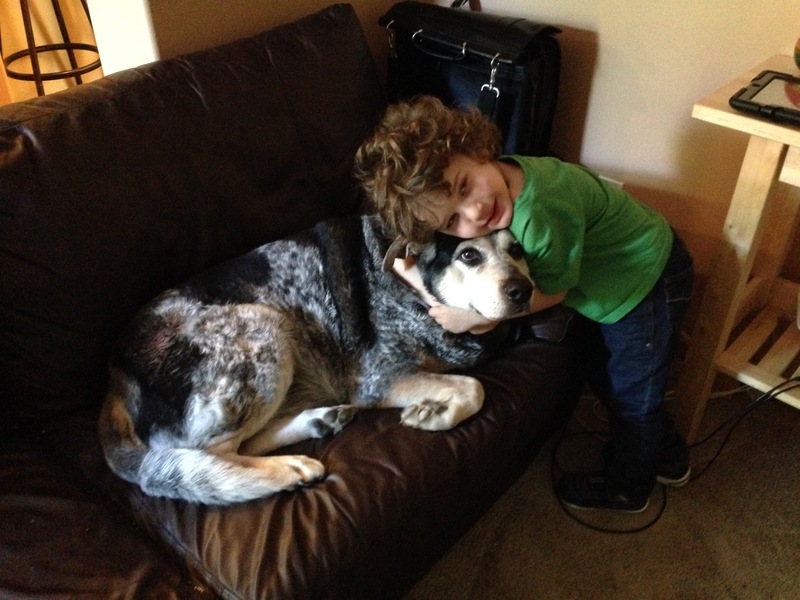 2015-01-29 00:29 UTC – In this video Alex talks to Roscoe about how much Roscoe loves him. 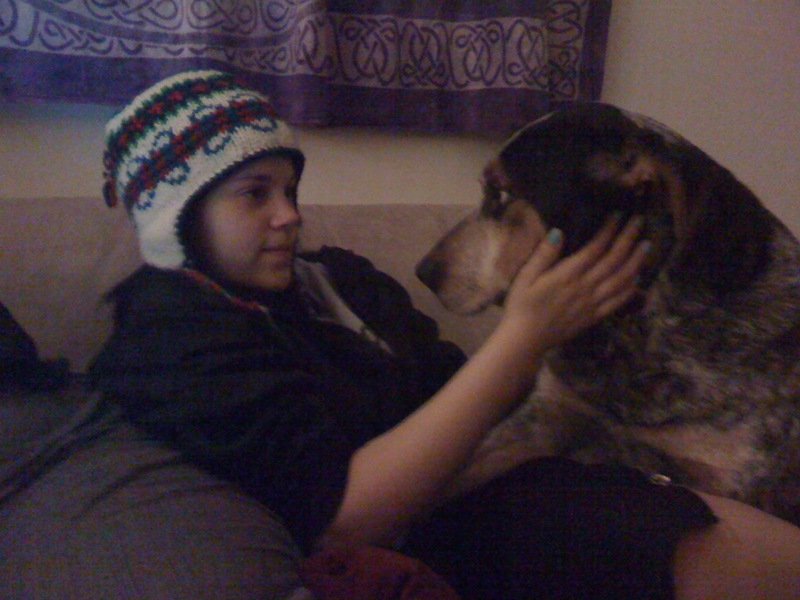 That Roscoe loves Alex more than Amy, more than anyone else does. This is all about how important they were to each other. 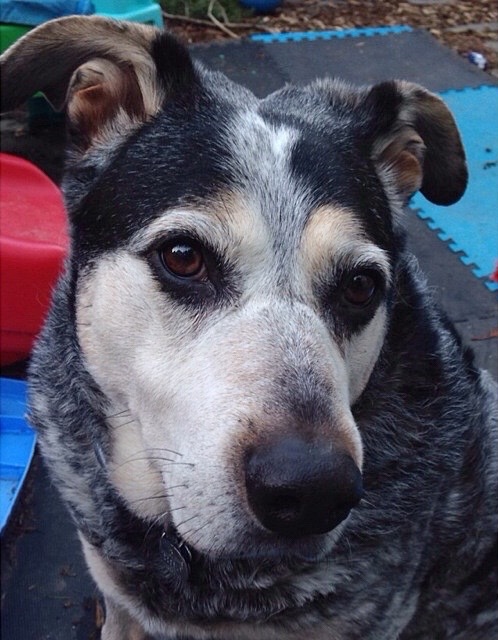 Not too long after this video, a couple weeks maybe, I was having a conversation with Alex and mentioned that Roscoe was an old dog, and we wouldn’t have him forever. Alex told me: “Roscoe can’t die. Roscoe loves me SO MUCH, he would never leave me! So he can’t die.” Oh, Alex, I can’t express how much I wish things worked that way. But they don’t. Breaks my heart. 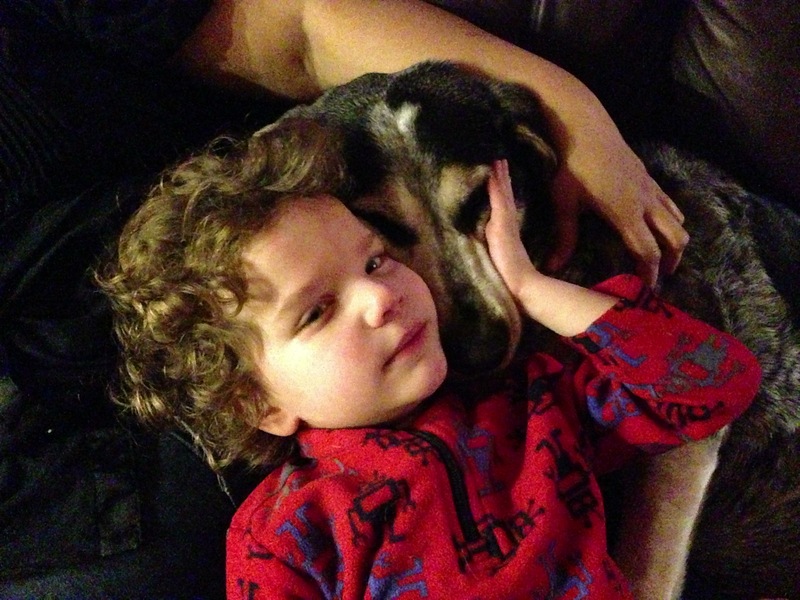 2015-02-02 23:15 UTC – Just more Alex and Roscoe being loving. 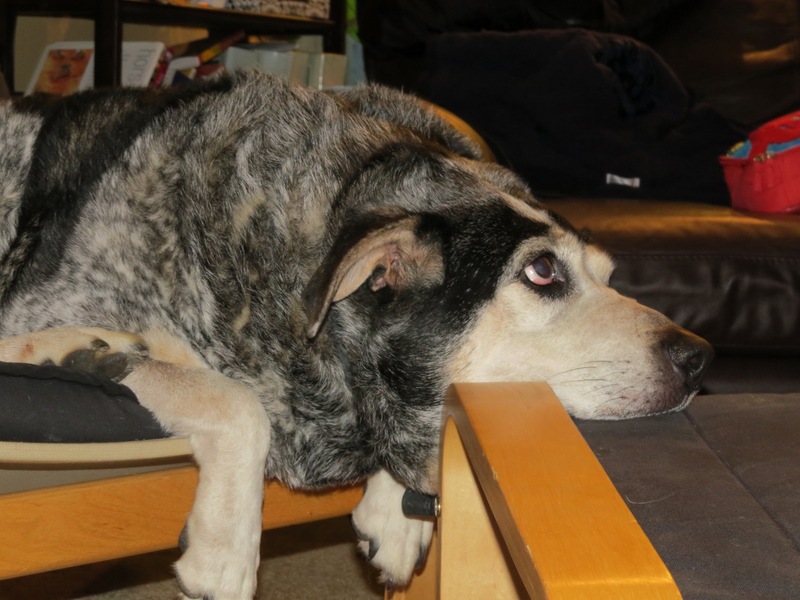 2015-02-02 23:16 UTC – You can tell Roscoe is getting to be an old man, and that he really just wanted to rest most of the time. 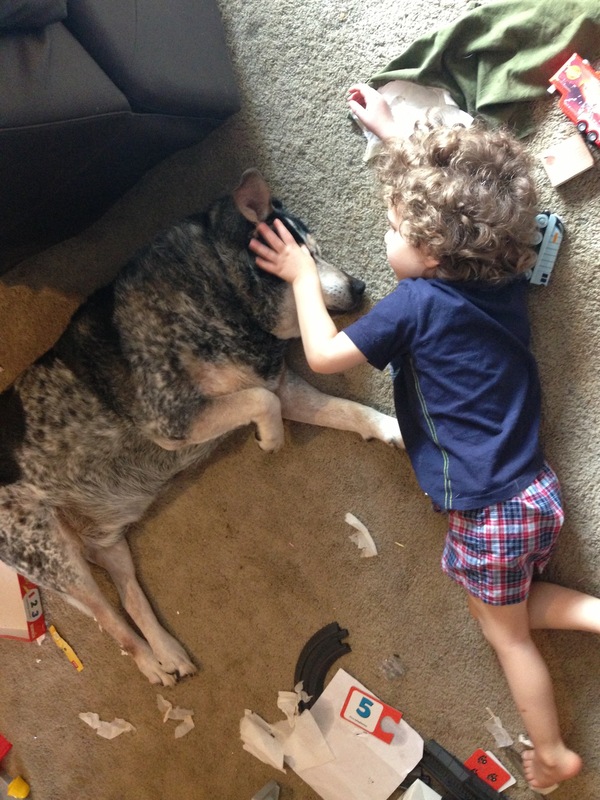 But even when Alex was being noisy and rough, Roscoe would always come back to be with him. 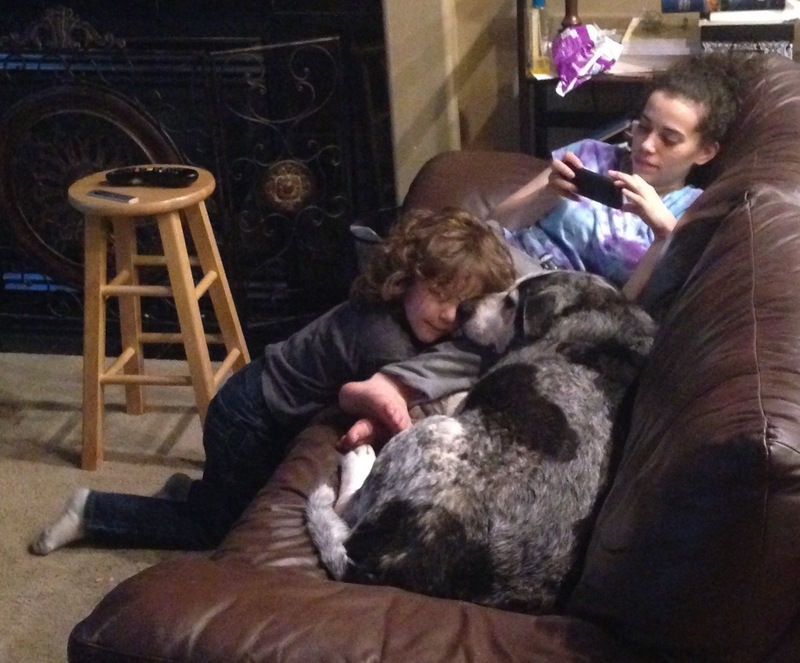 2015-02-03 07:16 UTC – Just more family cuddling on the couch. 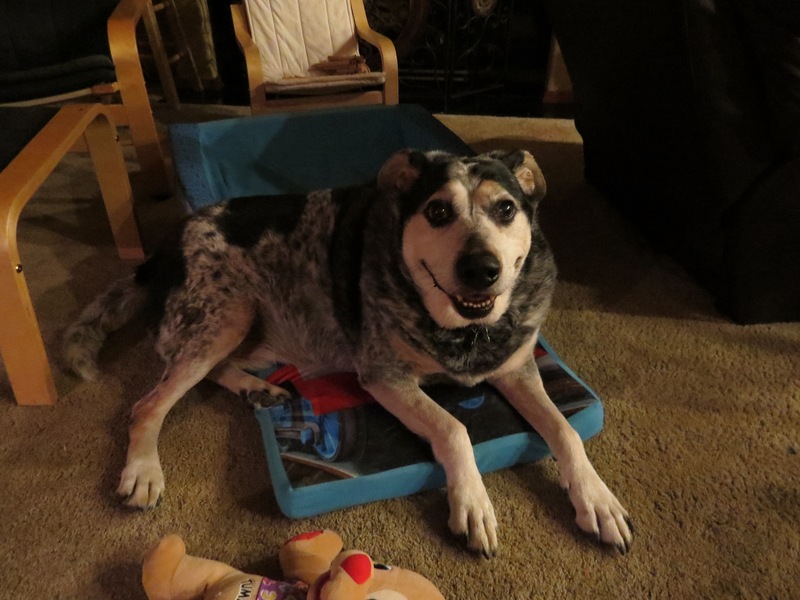 2015-02-16 19:57 UTC – Um, you know that cushion from the chair that I gave Roscoe as a bed? Well, he made it his own. 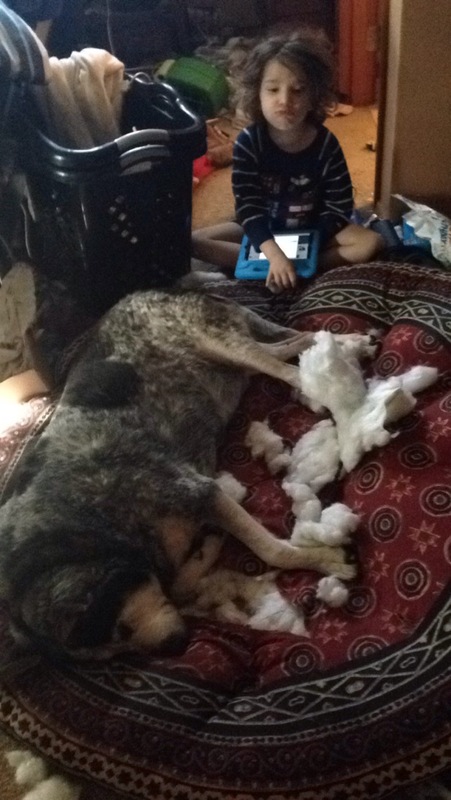 Ripped the cover to shreds, pulled out the stuffing, made a nest. We let him keep using it as a bed of course. It was his to do with as he pleased, and if that made it more comfortable for him, so be it. 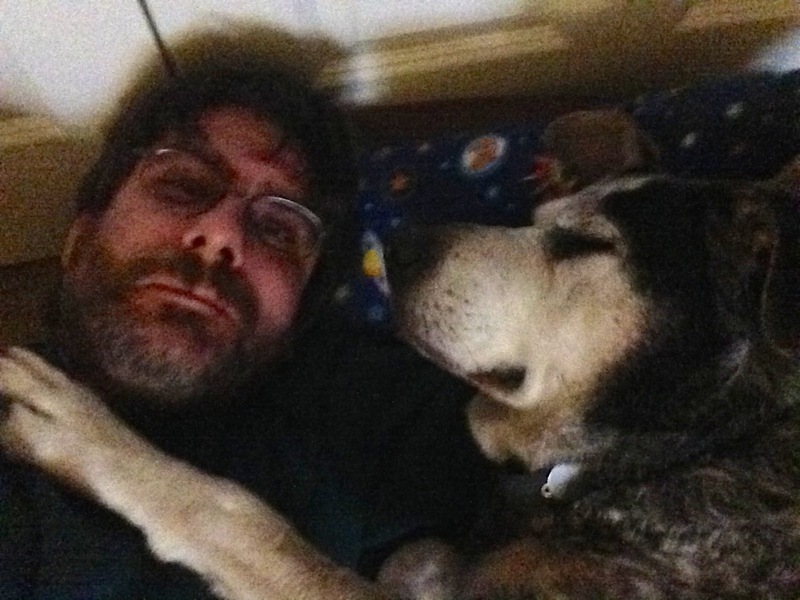 2015-03-01 04:24 UTC – Just another shot cuddling with me. 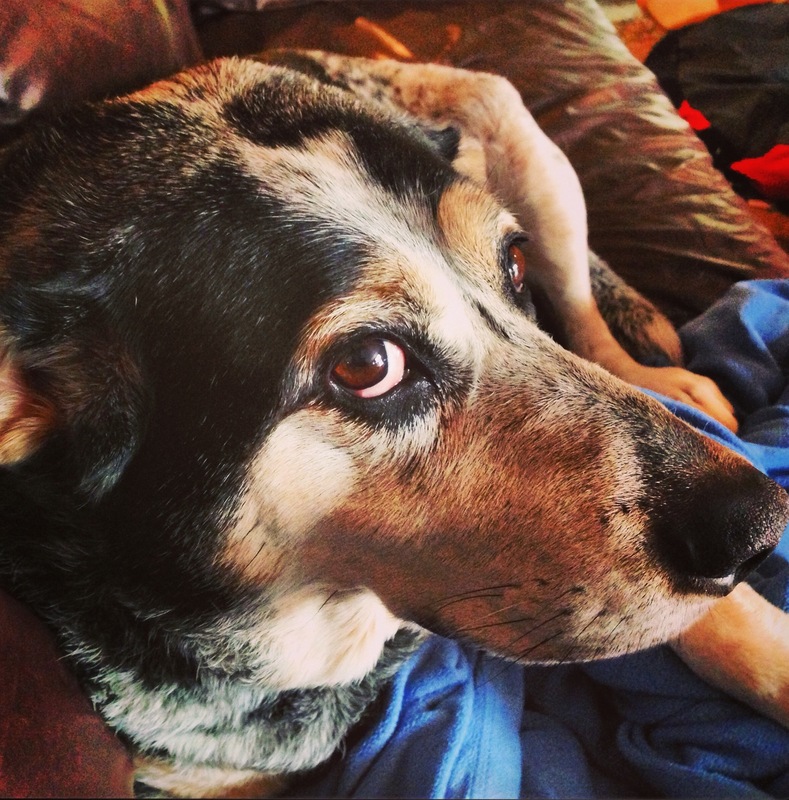 2015-03-18 04:46 UTC – Just Roscoe giving one of his looks. 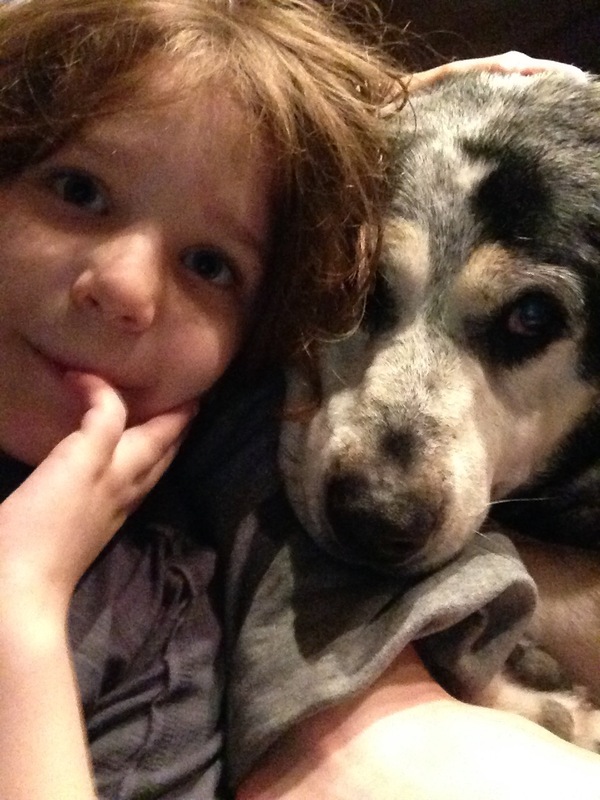 2015-03-22 19:02 UTC – Mommy is good to cuddle with. 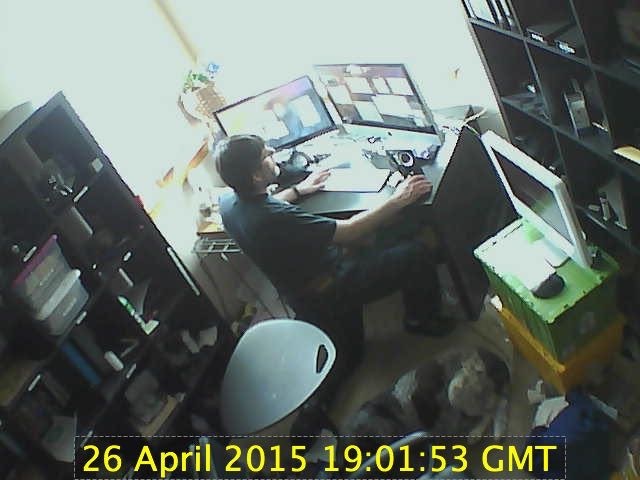 2015-04-17 04:51 UTC – We’re near the end now. About 10 days. Of course nobody knows this. Except maybe Roscoe. 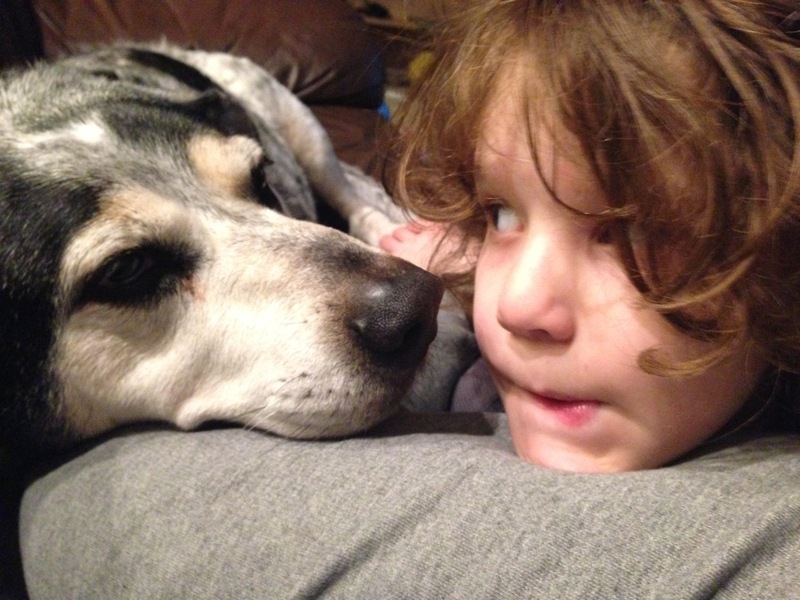 Meanwhile, Alex just looks into Roscoe’s eyes with obvious affection and adoration. Best friends for life. 2015-04-20 00:00 UTC – At the end of the weekend before Roscoe died, we were doing some work in the front of the house. I had my timelapse camera set up to catch some of it. We got a few moments of Roscoe hanging around with us while we went about our business. 2015-04-26 19:01 UTC – This is not a great picture of Roscoe. You can see part of him there. But my timelapse camera in my office caught just a short bit as I came up to my office for something, did it, and left again. This was the last photographic glimpse of Roscoe before he was clearly not doing well. In those few short minutes in real life, just a second or two on the timelapse, Roscoe followed me in and lay down at my feet. When I left, he left with me. 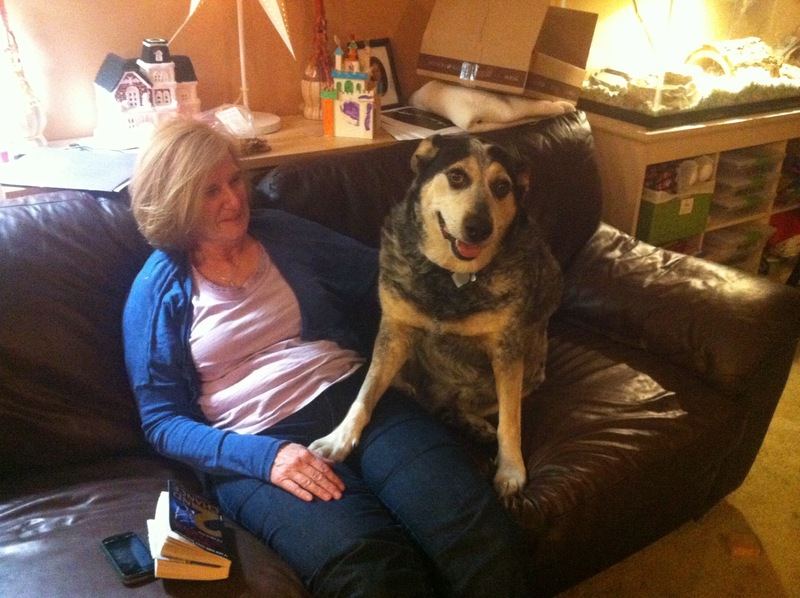 Very often when I was home, especially when Alex was otherwise occupied, Roscoe would follow me, and sit with me wherever I happened to go. 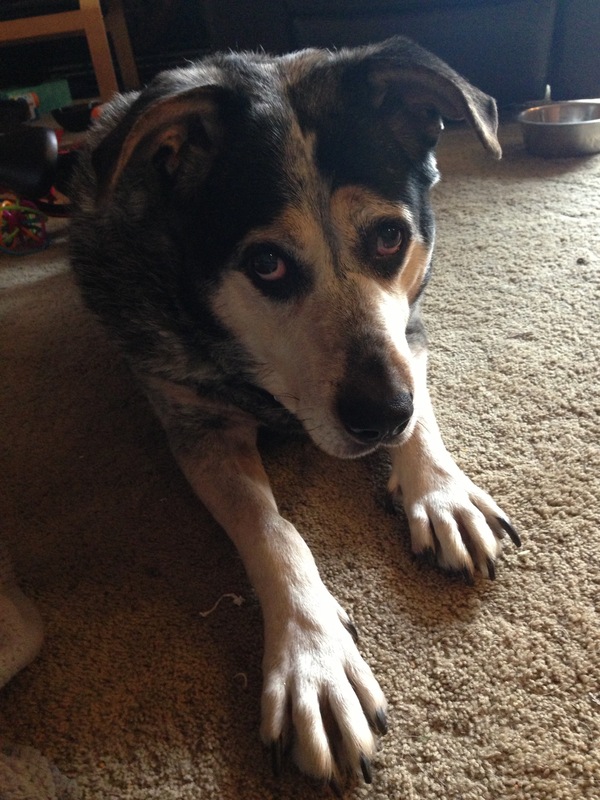 He didn’t start out that way, but he became extremely loyal and loving, and always wanted to be with us. He would do anything for his people, especially Alex. 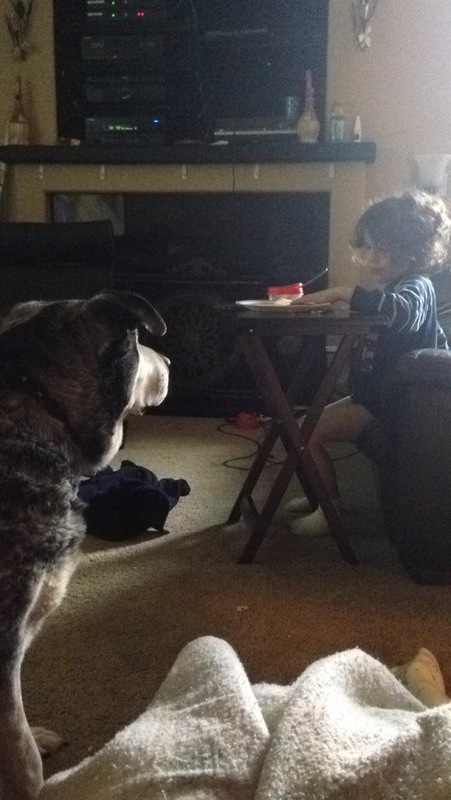 He was a good dog. A great dog. We miss him so much. Goodbye Roscoe. 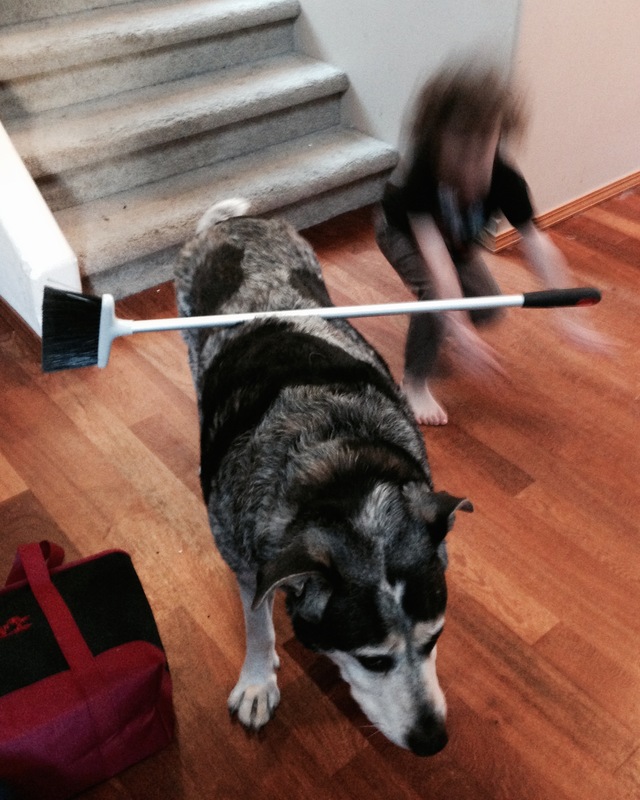 Good dog! We love you. 05:53:53 It has been a day now. Sad day. 04:49:50 We thought we were going to have to get him out and carry him (100 lbs) but with prodding he walked slowly and unsteadily to the car. 04:51:46 Hoping for something simple & curable, but he is an old guy, so… Feeling anxious & sad. Sitting in the waiting room 4 news from vet now. 05:22:41 Roscoe isn't going to make it. Internal bleeding from a tumor. None of the aggressive treatment options good. Very very sad night. 17:36:05 Spent the night going through old pictures to make a blog post on Roscoe. Have to narrow it down from 230 pics to a more reasonable number. 17:37:48 Taking a break to hang out with Alex though, who says he is sad because I am sad, and just wants to make me happy. Can't ask for more. 23:34:50 Not letting myself worry about artificial self imposed deadlines for making my Roscoe memorial post. I will be done when I'm done. 23:36:39 So I'm trying to finally get a few winks, and spend time with the family and being sad. Will work on the post when I work on the post. Edit 02:13 UTC to put a couple retweets I did later than I should have in logical order for the conversations. 06:42:01 Retweeted @anamariecox 02:44:18 The thing about cnn telling people to go online to look for real news about real things is that of they already are. That’s cnn’s problem. 18:13:37 Retweeted @xeni 2015-04-25 16:46:43 C.S. Lewis fan: "I'd like to visit Narnia." Tolkien fan: "I'd like to live in Middle-Earth." George R.R. Martin fan: "Nope, I'm good." 08:04:21 New @stnorbert 2016 poll in Wisconsin added today. See http://t.co/DURWAhb7mq and @ElecCollPolls for details.